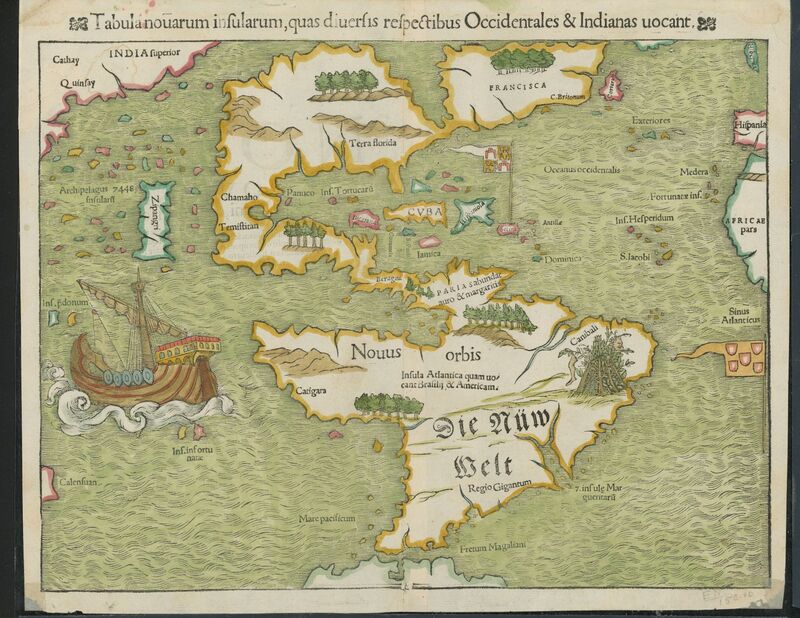 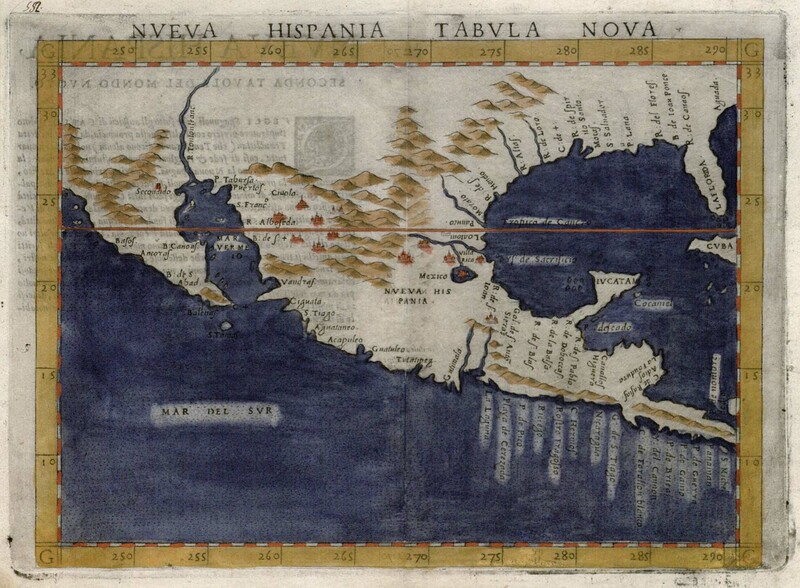 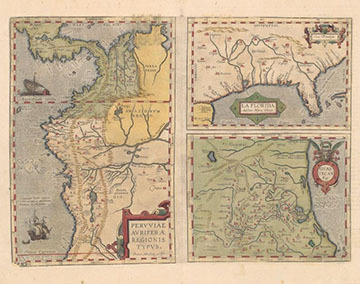 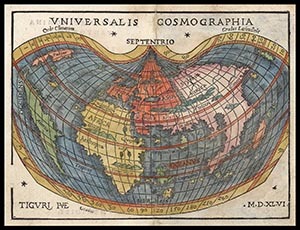 Citation: Girolamo Ruscelli, Nueva Hispania Tabula Nova. 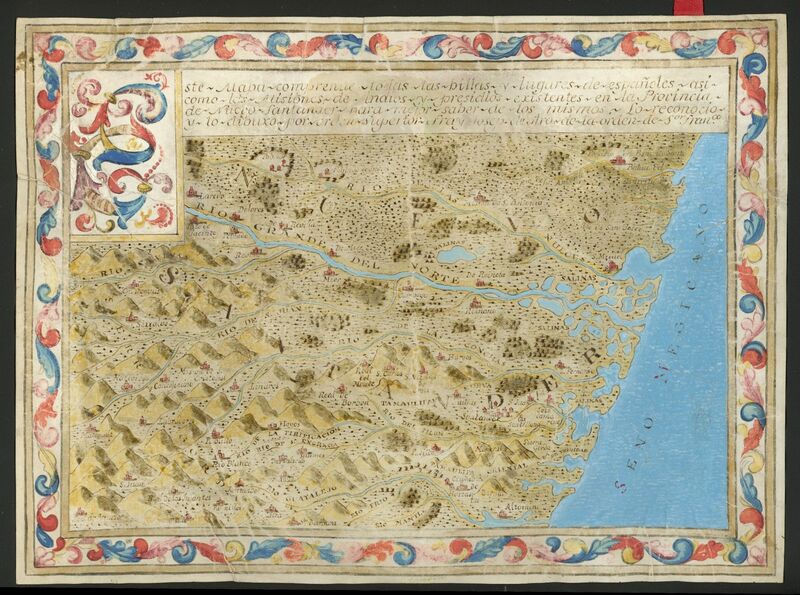 Venice: Ruscelli, 1574. 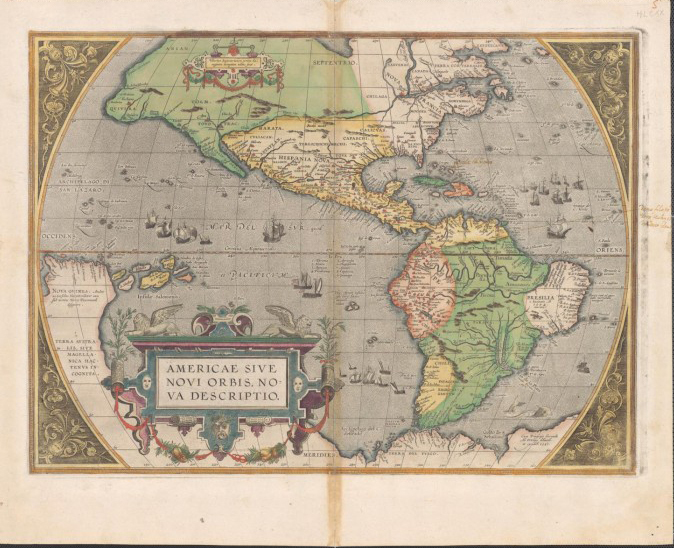 UTA Libraries Special Collections. 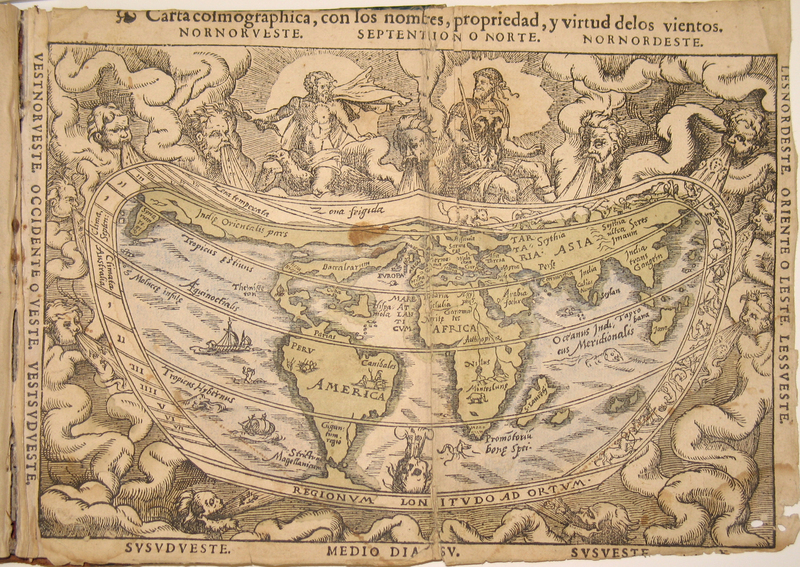 Citation: Abraham Ortelius. 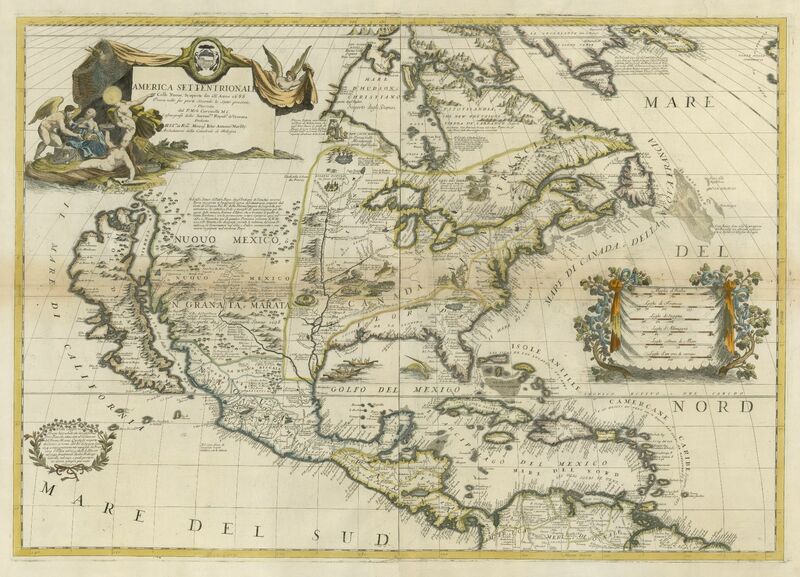 America Sive Novi Orbis. 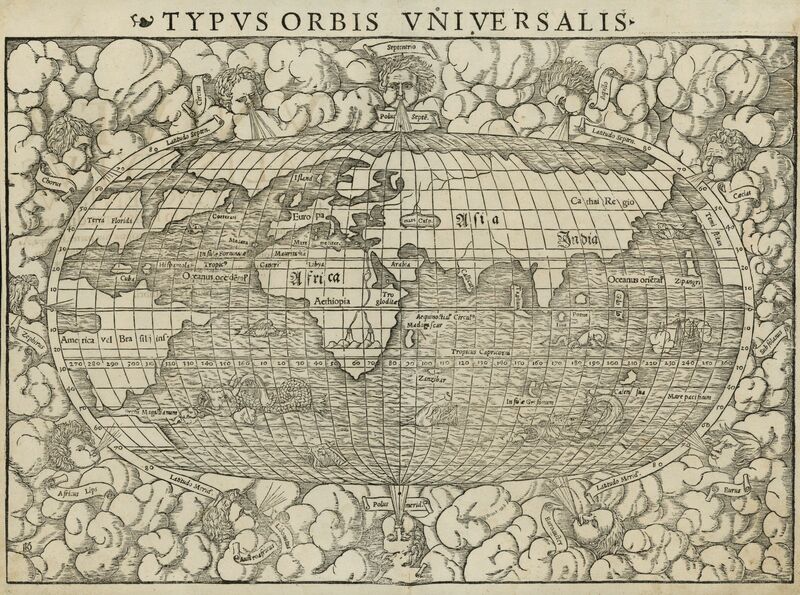 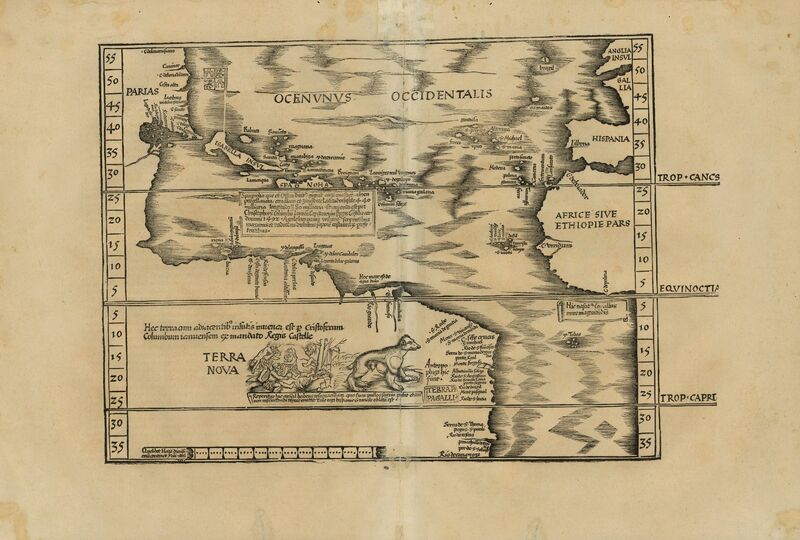 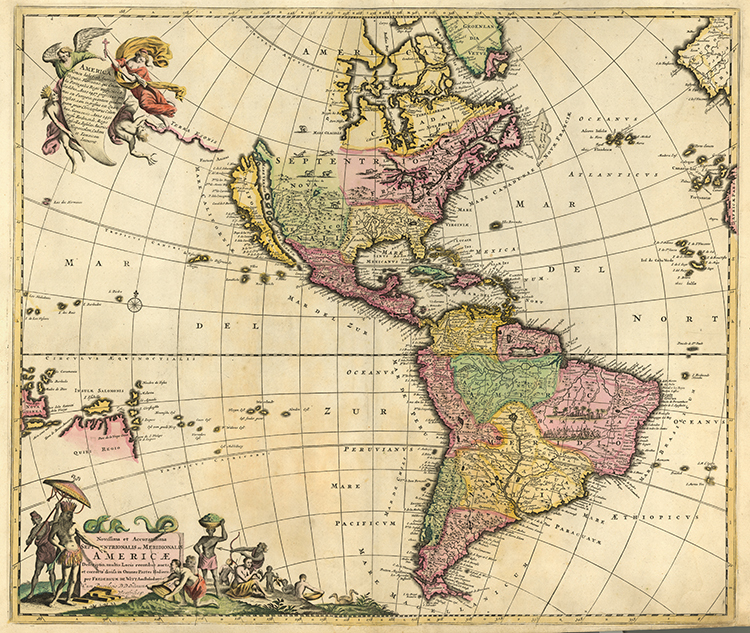 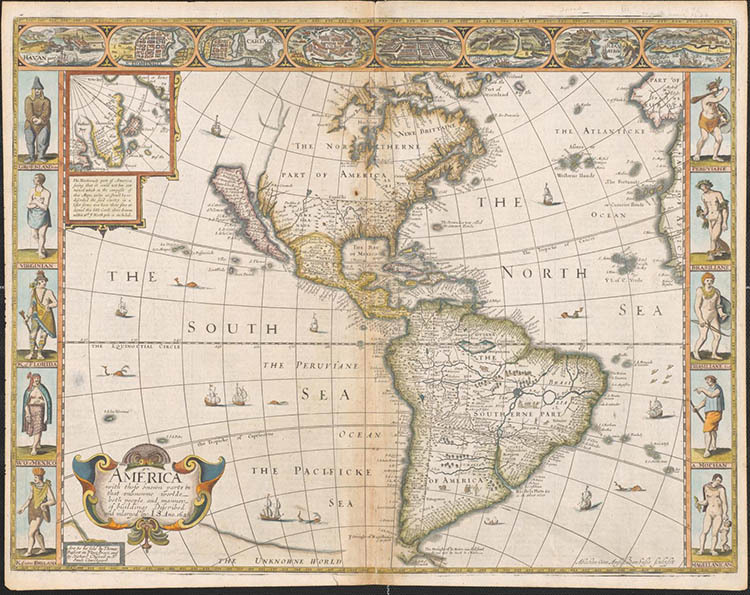 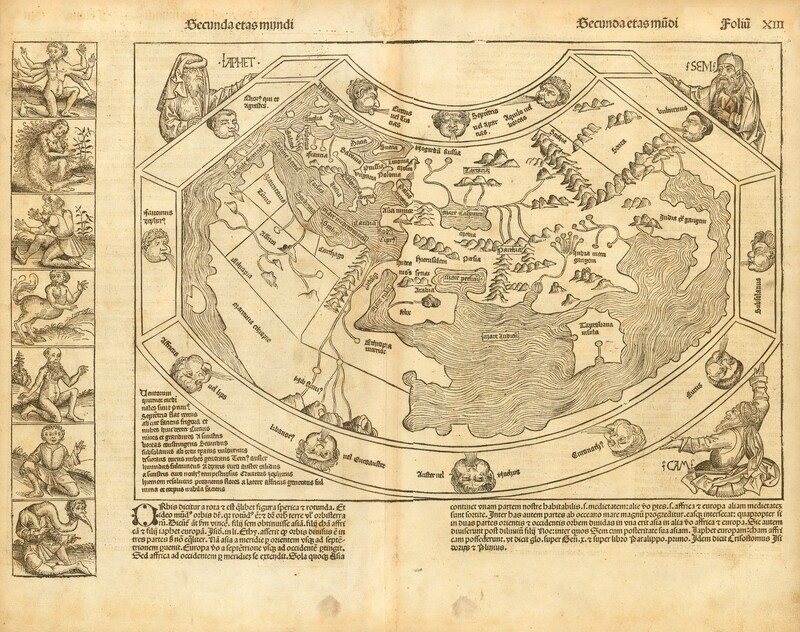 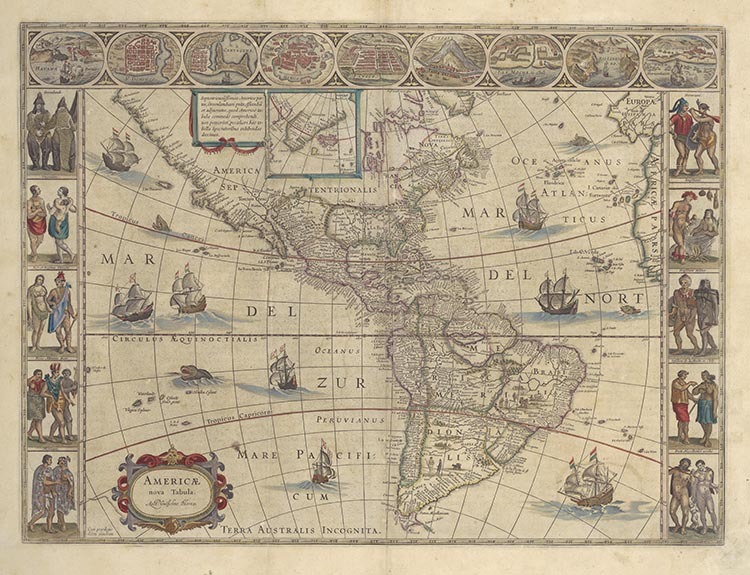 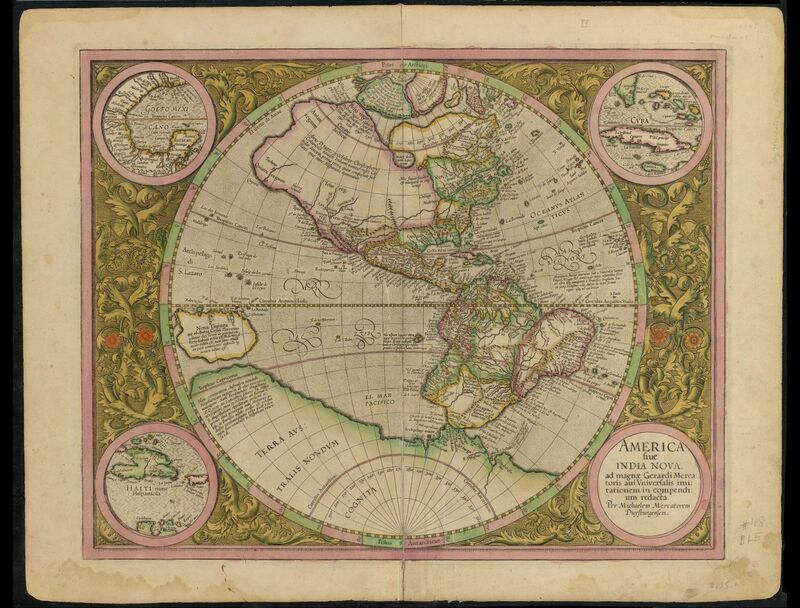 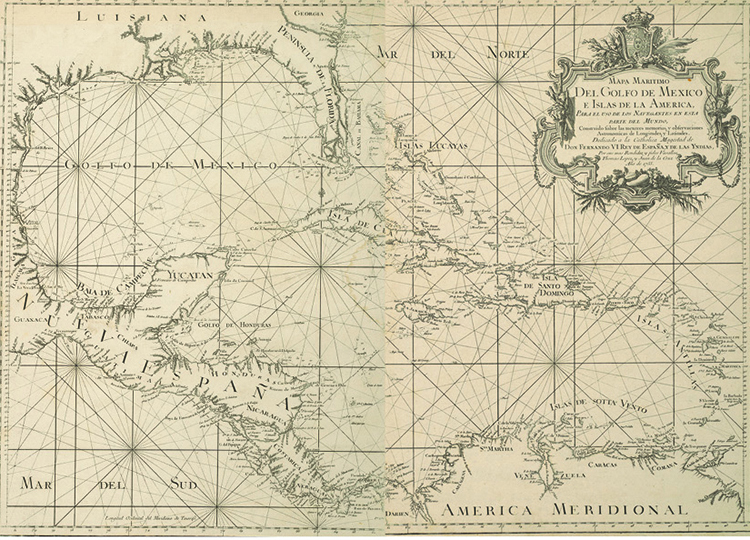 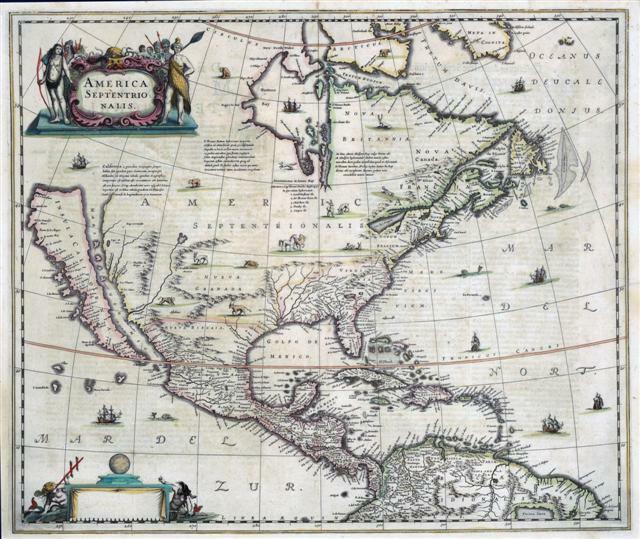 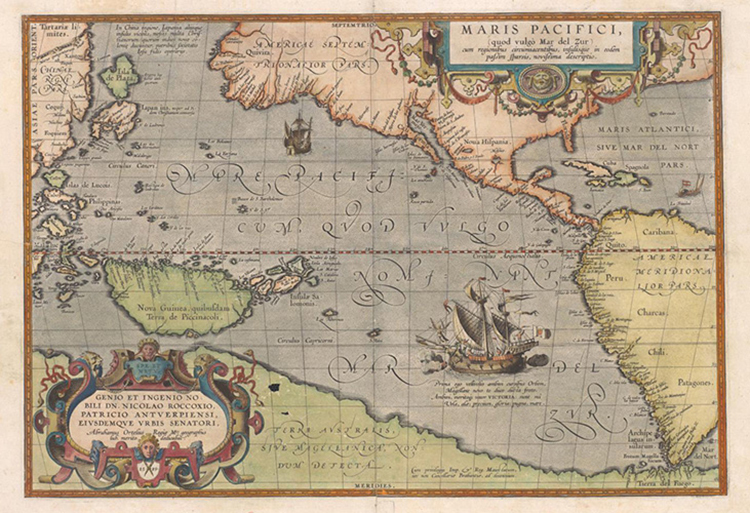 Citation: Hessel Gerritsz., Americae sive Indiae occidentalis tabula generalis, (Leiden: De Laet, 1630). 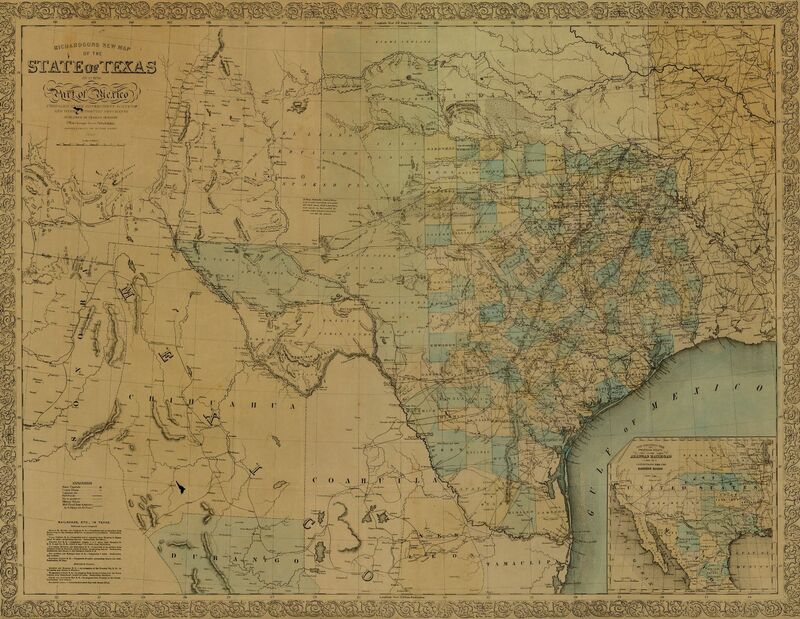 The University of Texas at Arlington Libraries Special Collections. 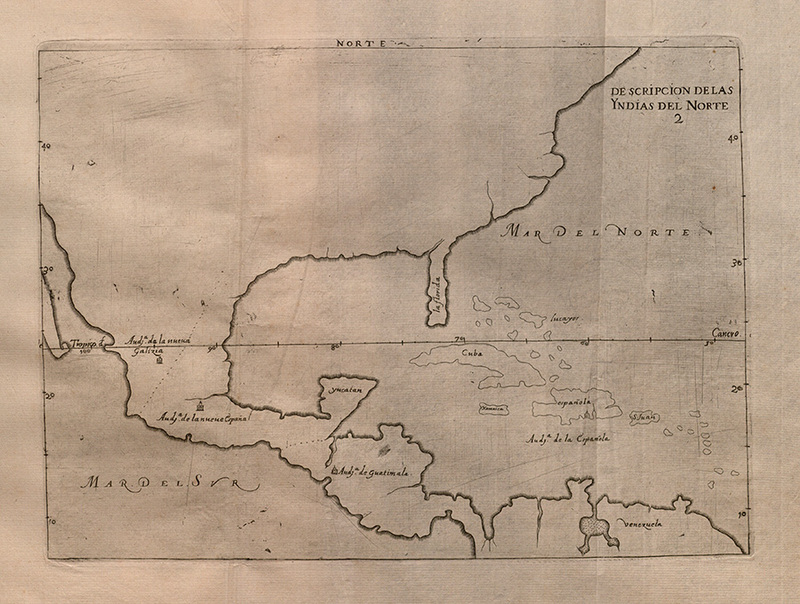 Citation: Thomas López y Vargas Machuca and Juan de la Cruz Cano y Olmedilla, Mapa Maritimo del Golfo de Mexico e islas de la America, engraving with etching on two sheets on paper, each approximately 58 x 42 cm. 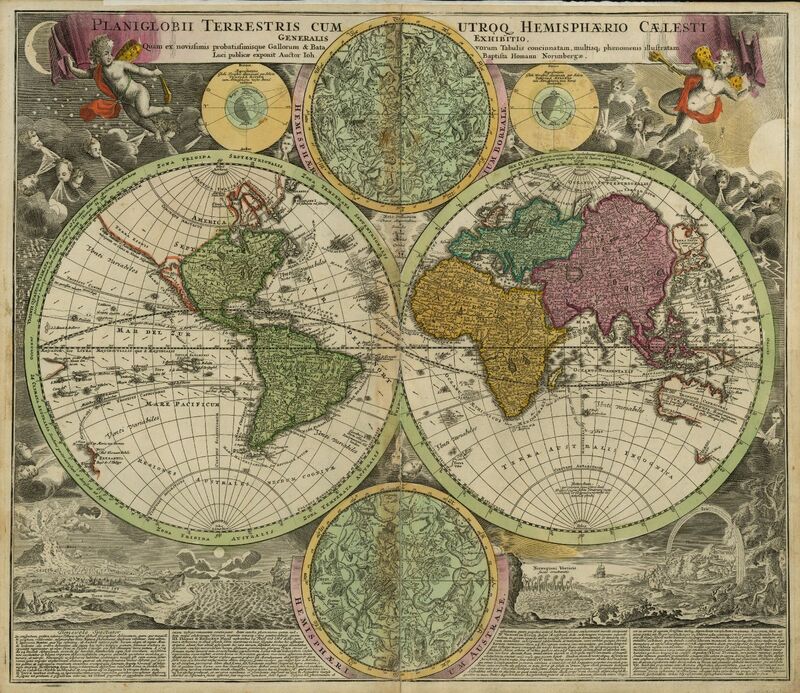 (Paris, 1755). 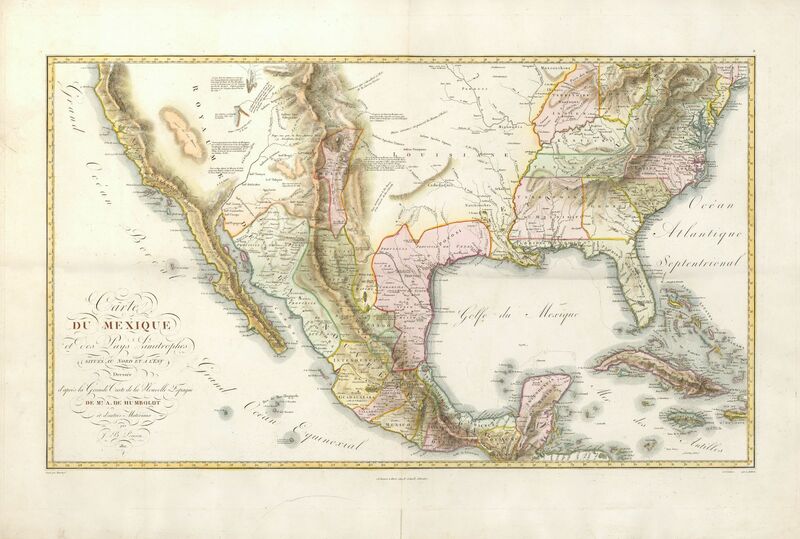 Citation: Joseph de Haro(?). 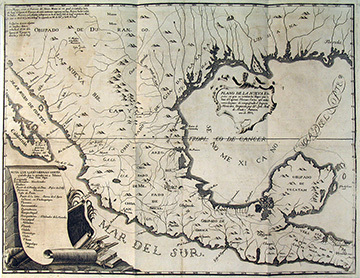 Nuevo Santander, Mexico. 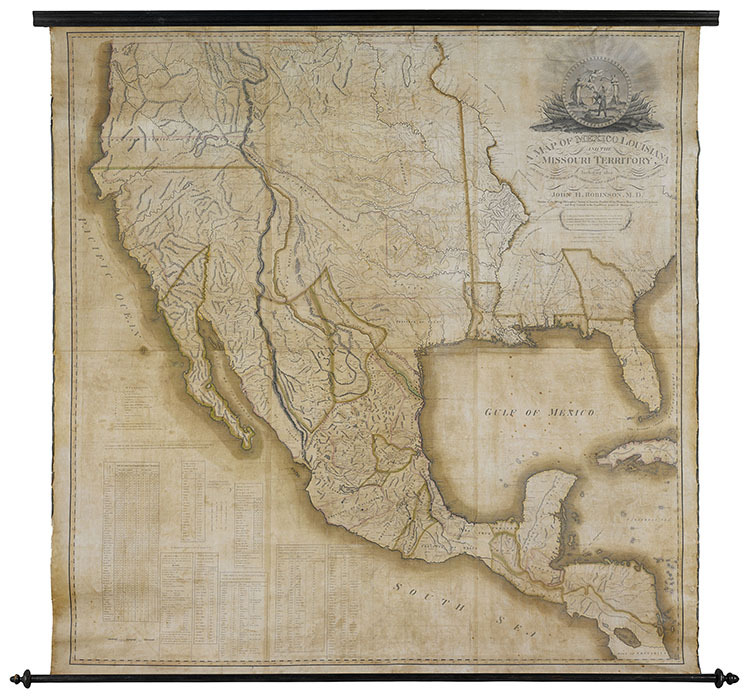 [Mexico, after 1770]. 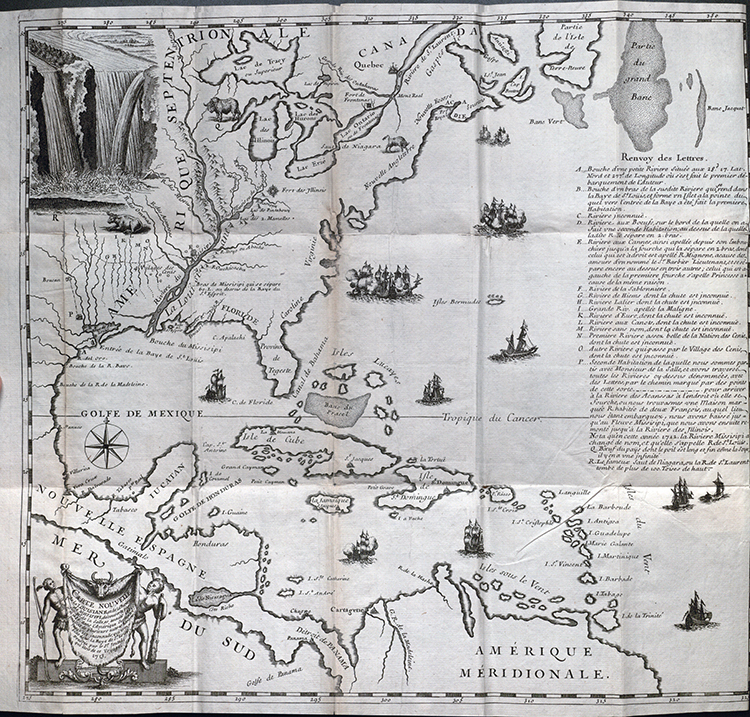 Note: The ribbon in the upper right hand corner (attachment) was added long after this map was produced. 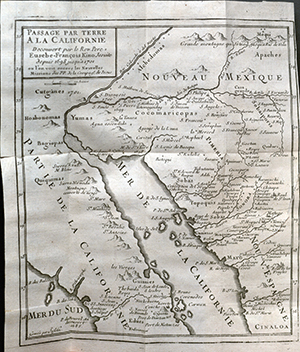 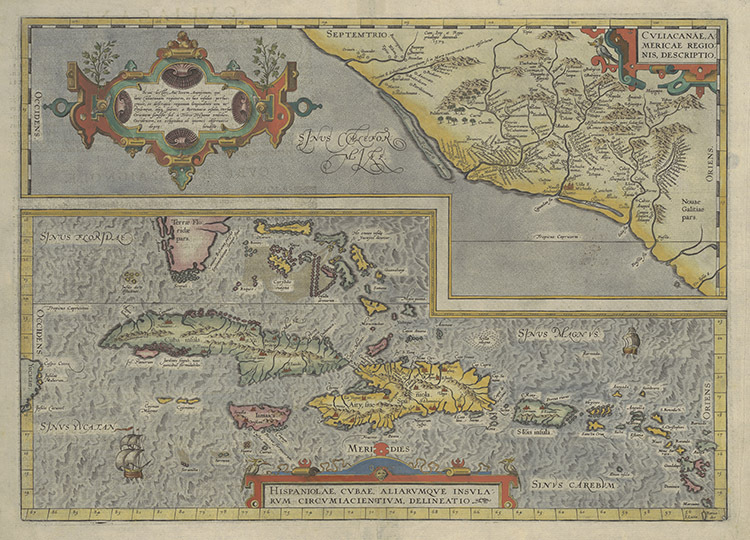 Citation: Rigobert Bonne, Carte du Mexique ou de la N[ouve]lle Espagne contenant aussi le Nouveau Mexique, la Californie, avec une partie des pays adjacents, engraving with applied coloring on paper, 28 x 40 cm. 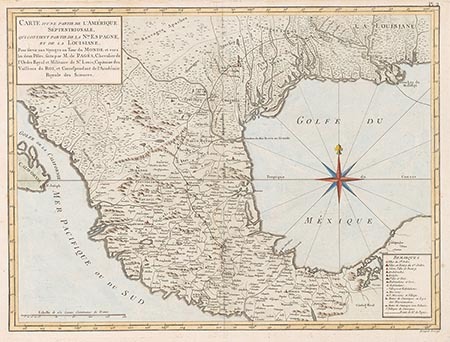 (Paris: chez Lattre, 1771). 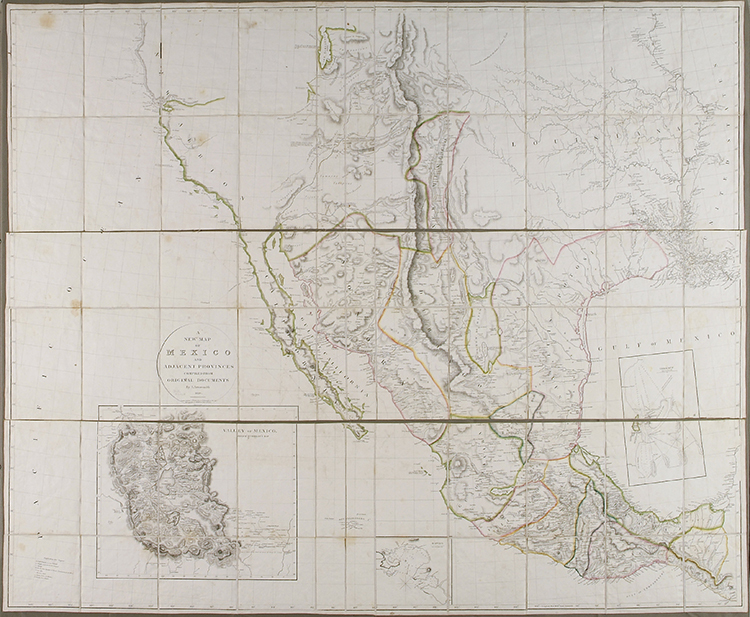 Citation: Alexander von Humboldt. 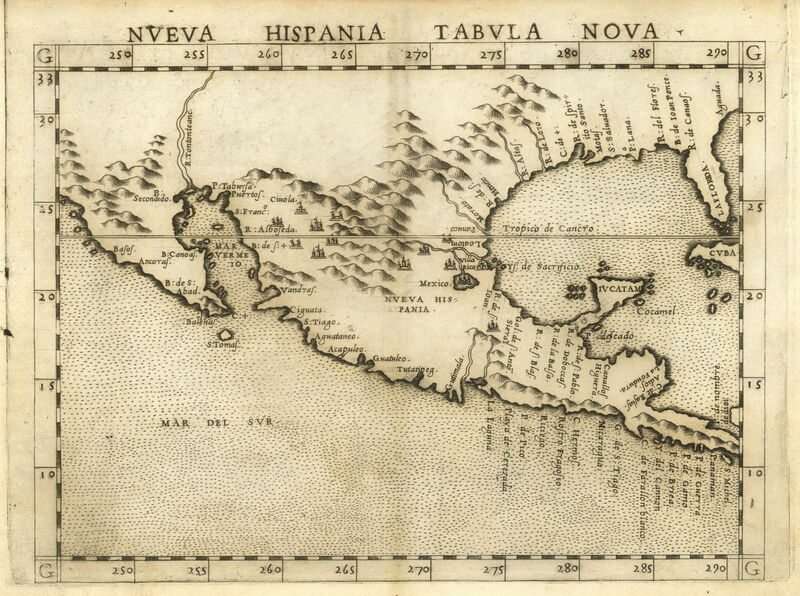 A Map of New Spain. 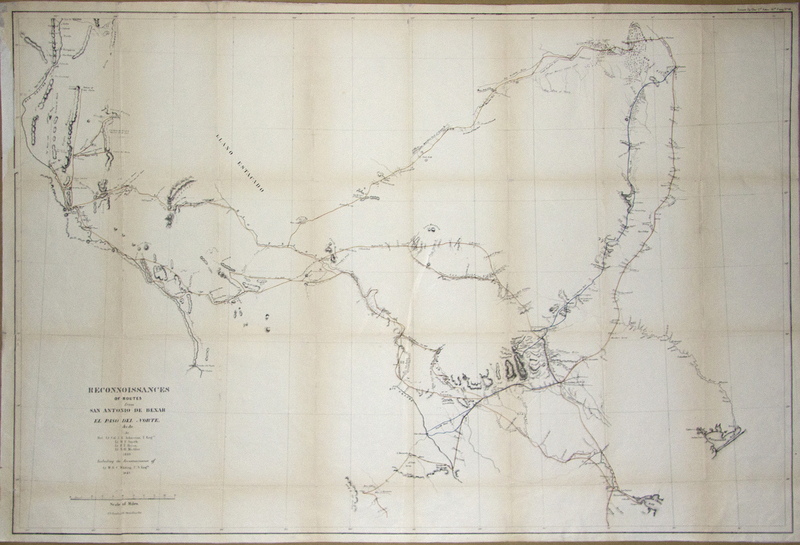 London: Longman, Hurst, Rees, Orme and Brown, 1810. 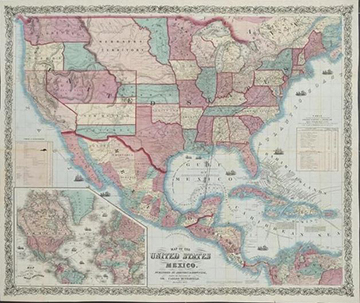 Citation: Zebulon Montgomery Pike. 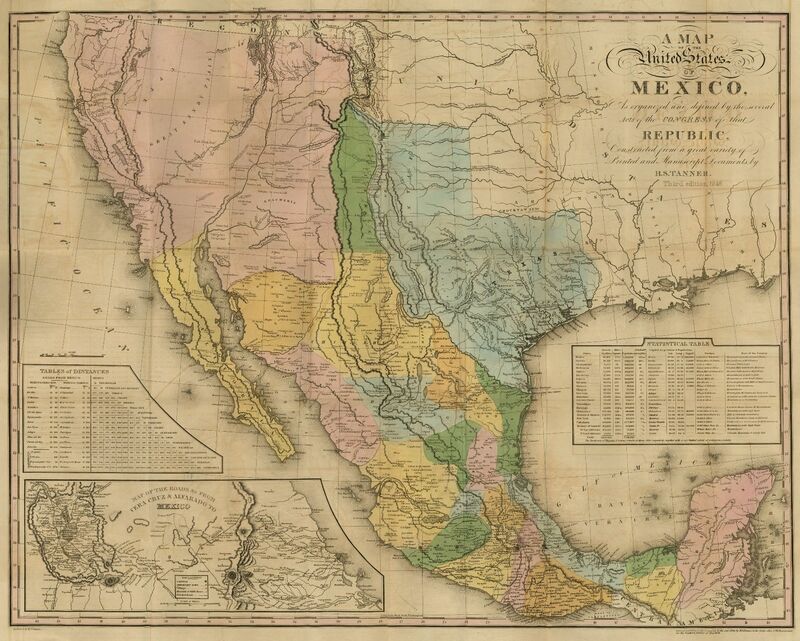 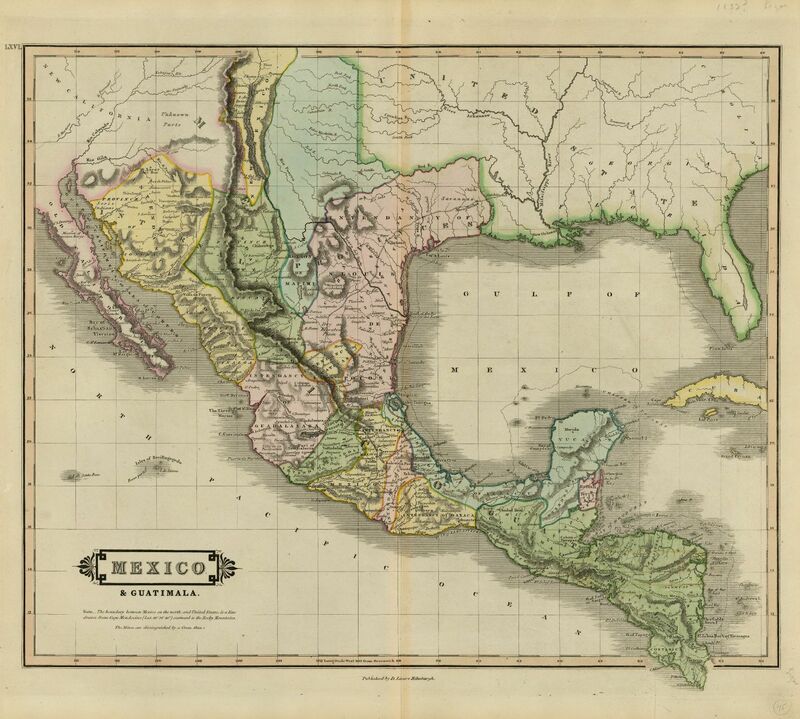 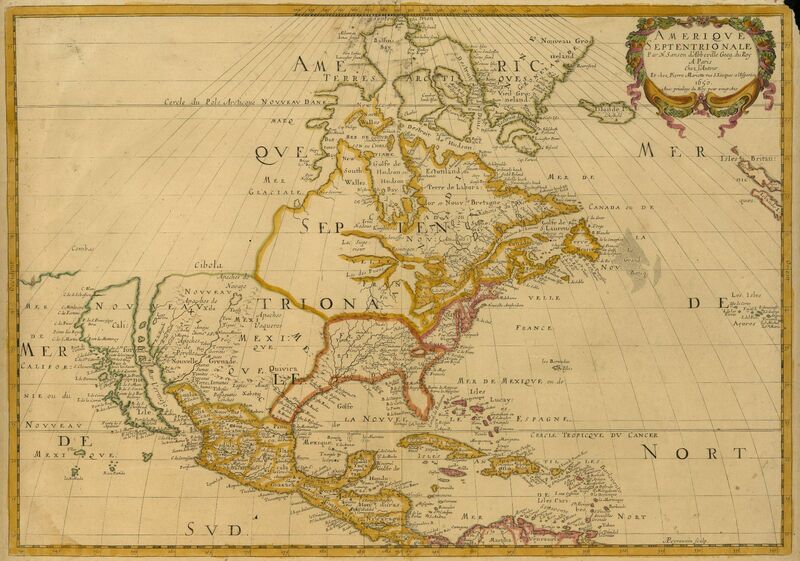 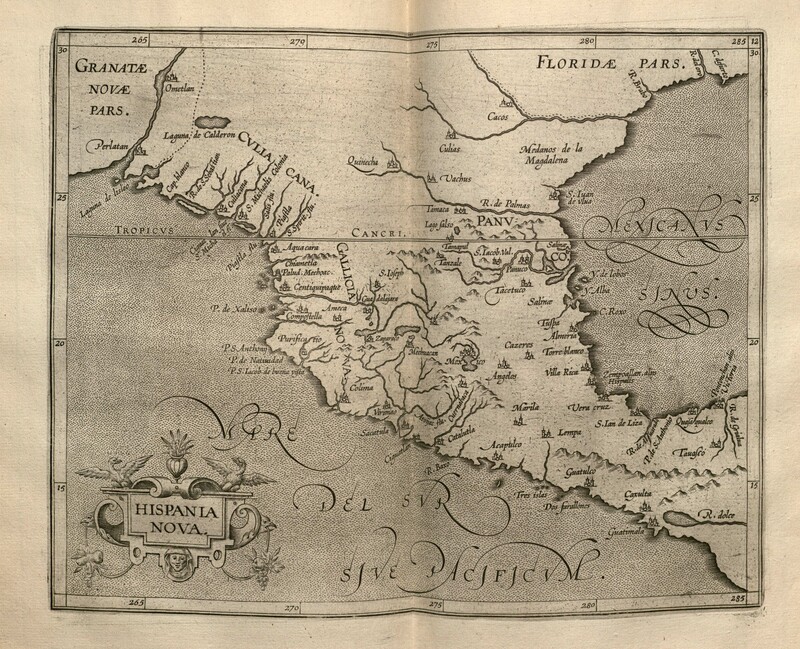 A Map of the Internal Provinces of New Spain…. 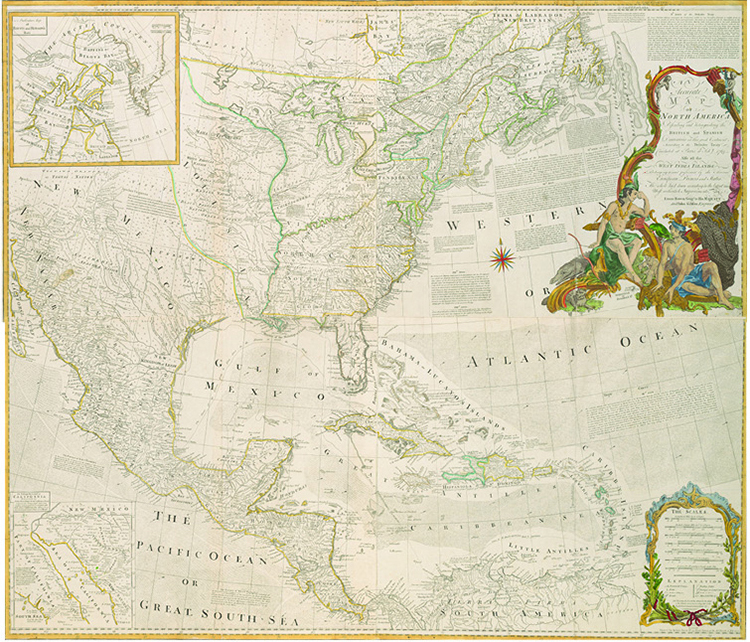 Philadelphia: , 1810. 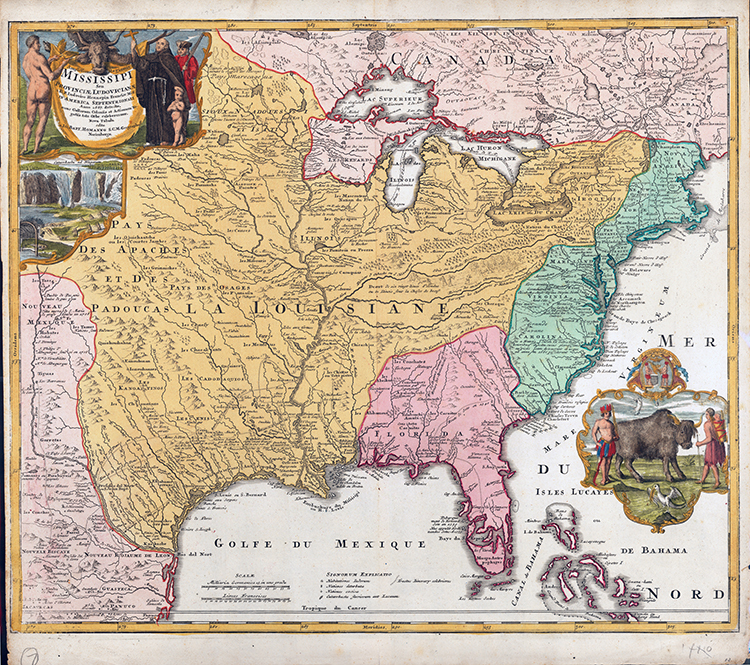 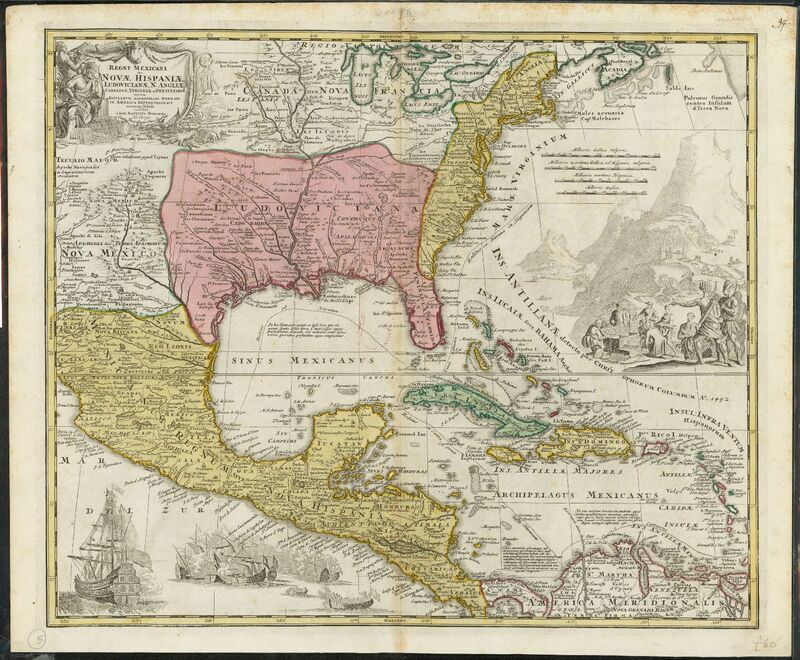 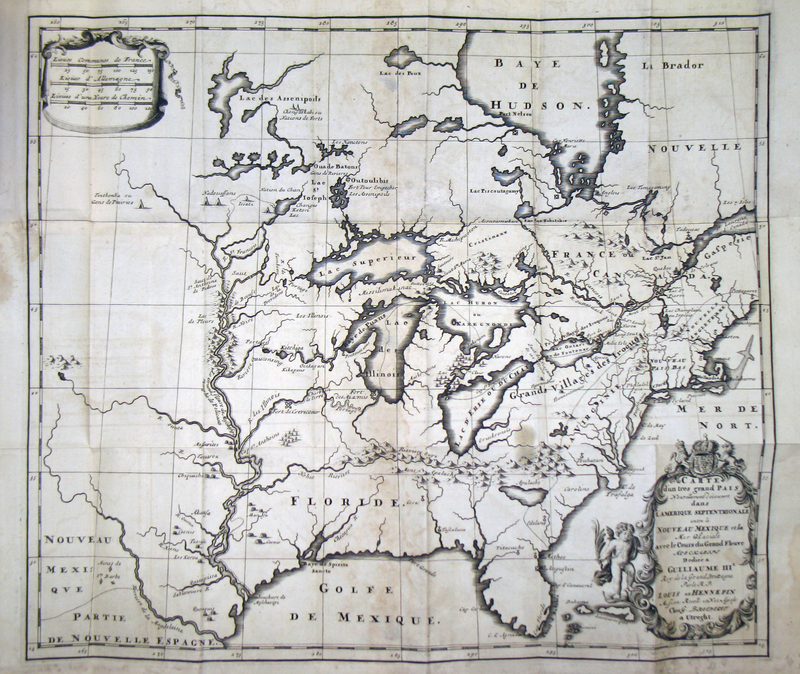 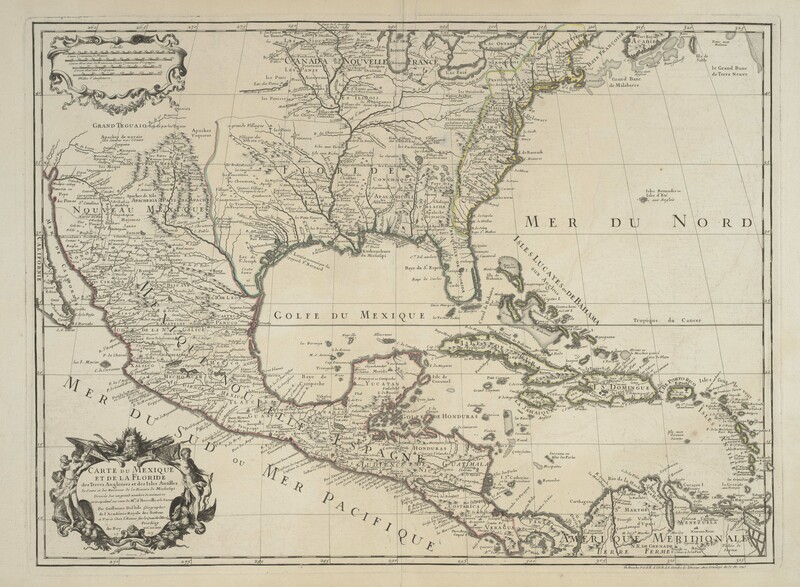 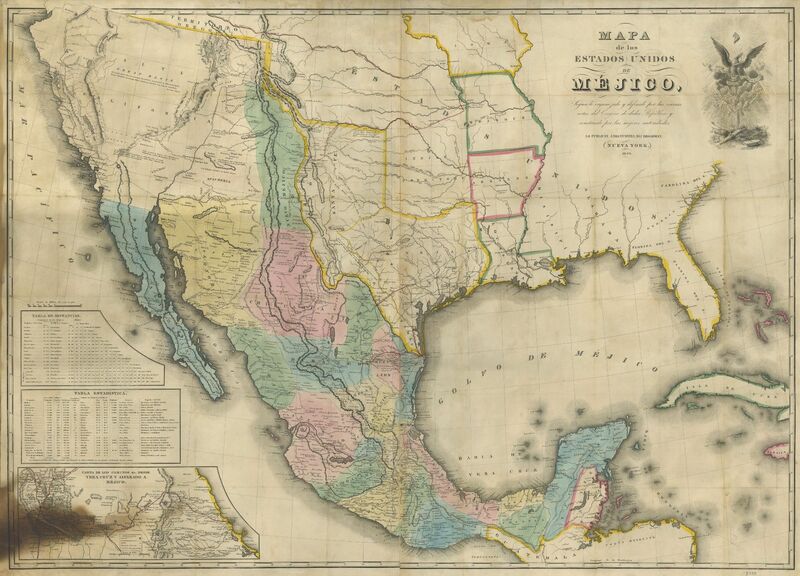 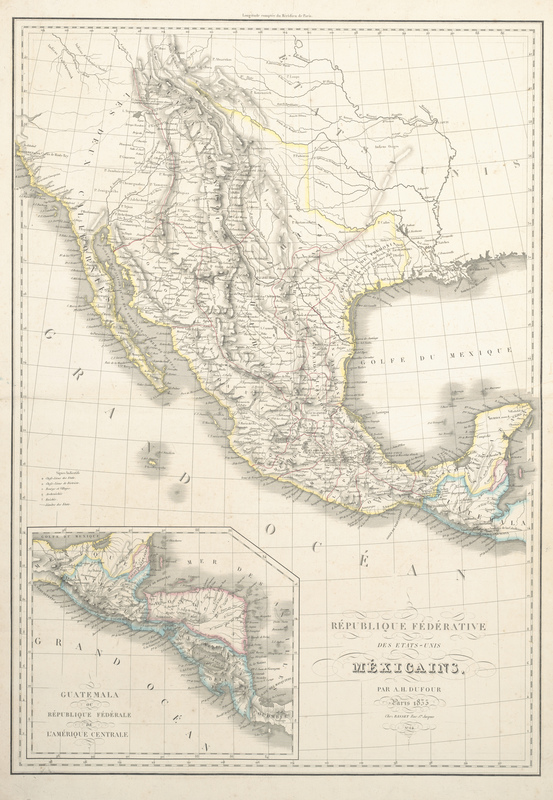 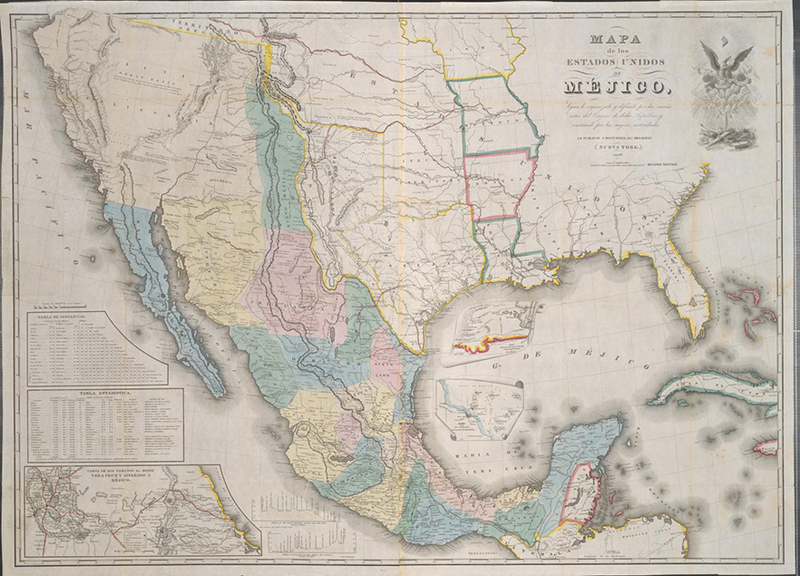 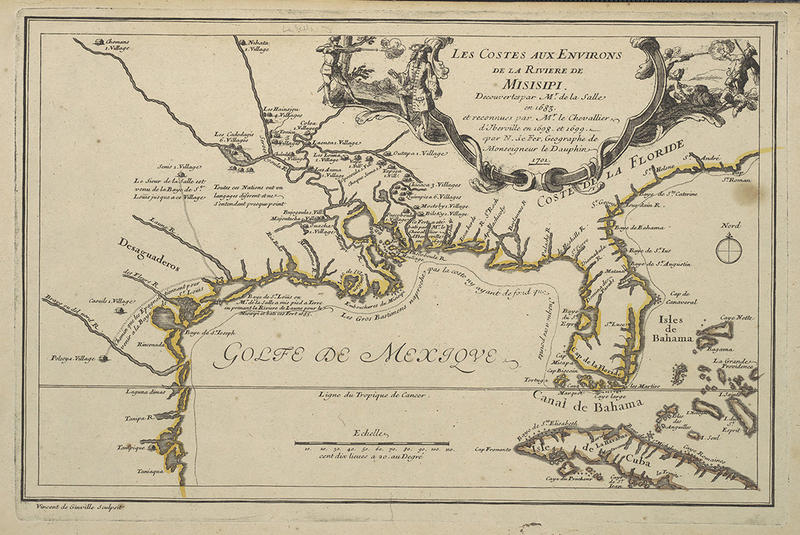 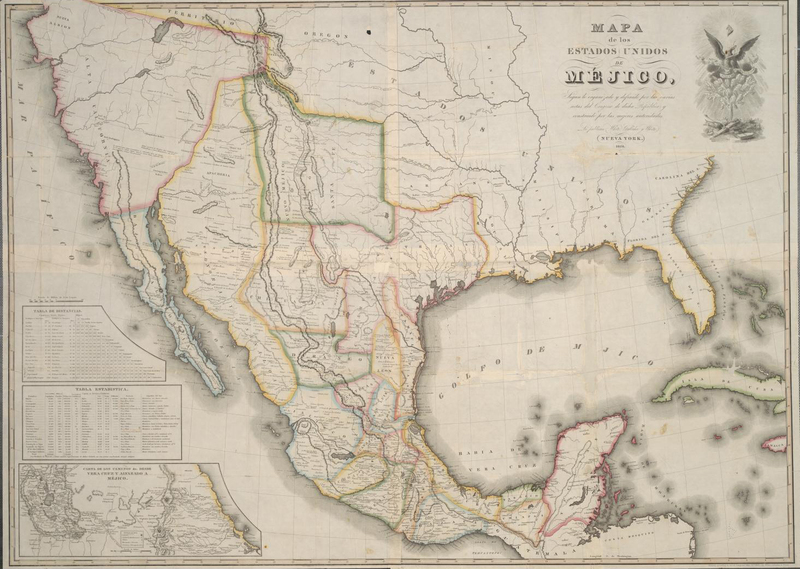 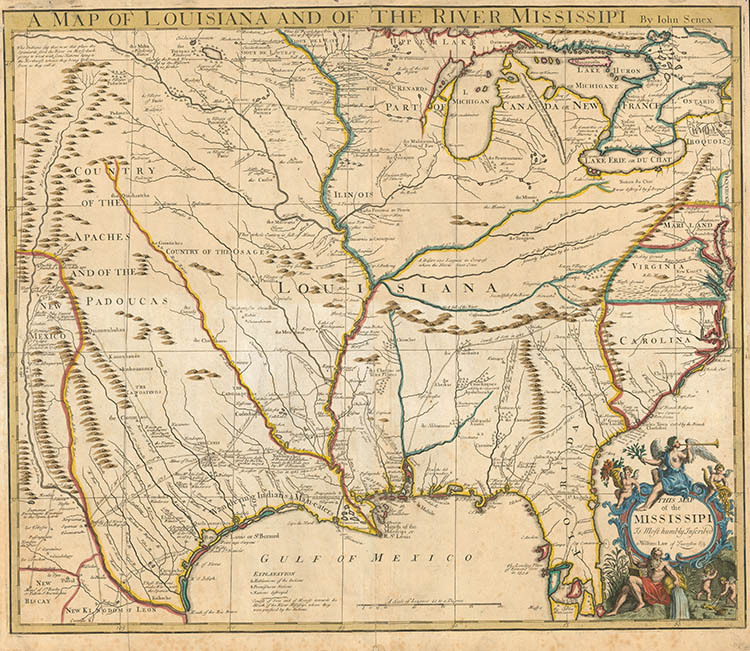 Citation: A Map of Mexico, Louisiana, and the Missouri Territory. 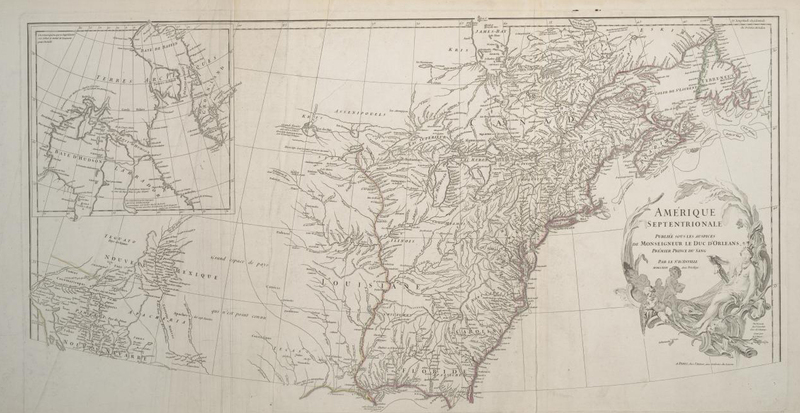 Philadelphia: John H. Robinson, 1819. 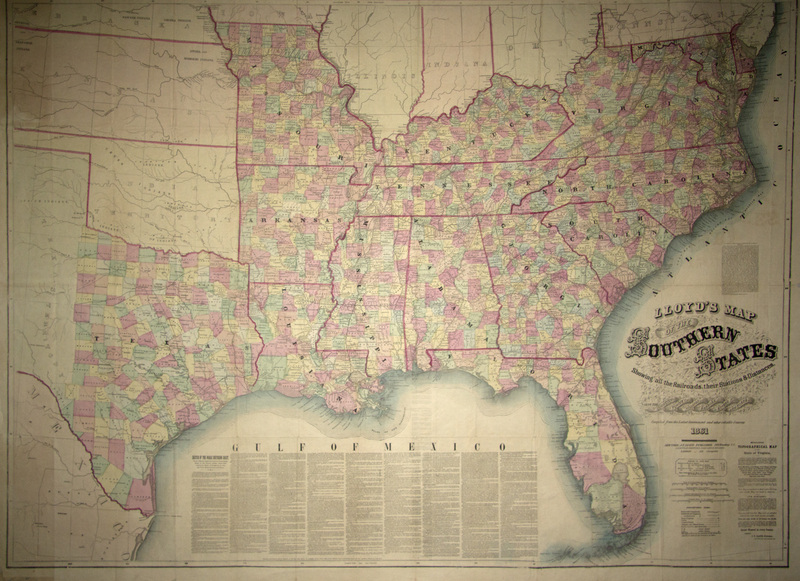 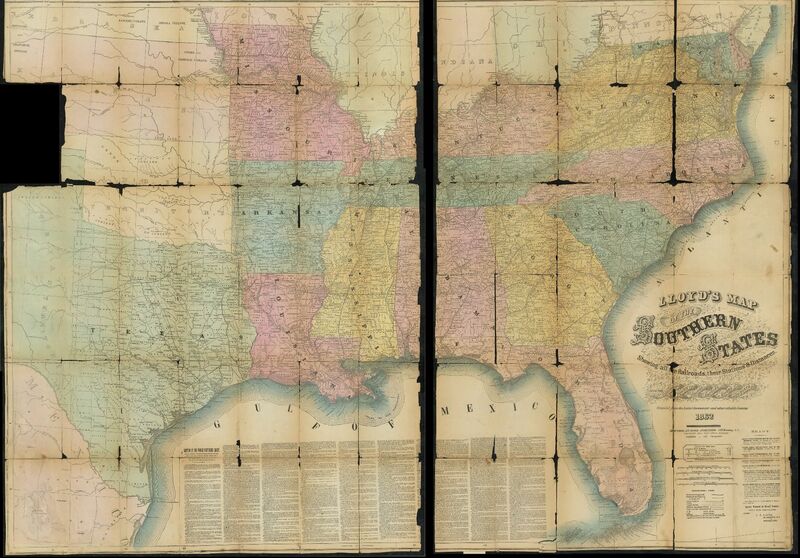 Citation: Stephen H. Long, Geographical, Statistical and Historical Map of Arkansas Territory, engraving with applied hand coloring on paper, 44 x 55.2 cm., engraved by Young & Dellecker, from Henry C. Carey and Isaac Lea, comp. 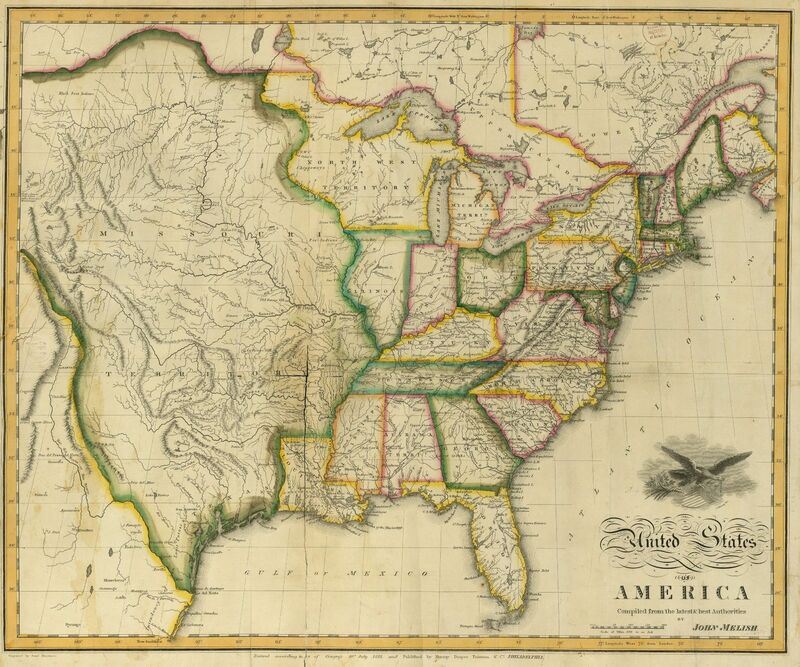 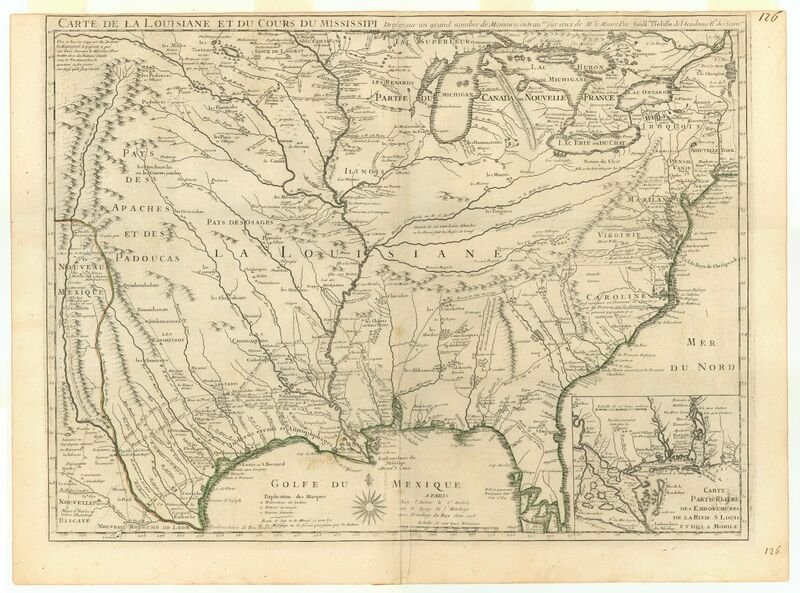 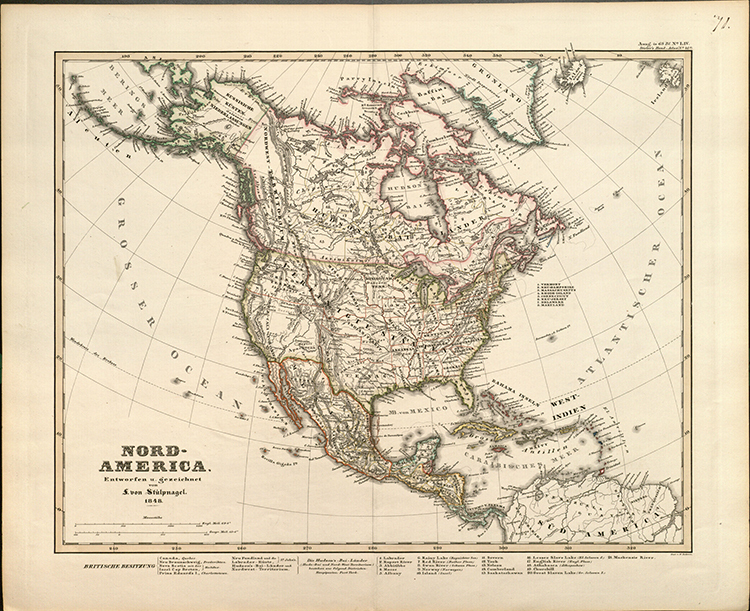 A Complete Historical, Chronological, and Geographical American Atlas…(Philadelphia: H. C. Carey and I. Lea, 1822). 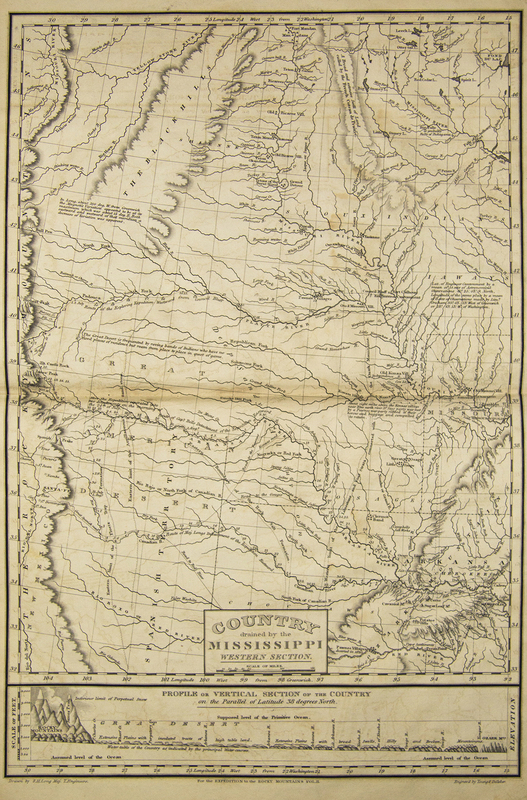 Citation: Stephen H. Long, Country Drained by the Mississippi, Western Section, engraving, 41.5 x 28 cm. 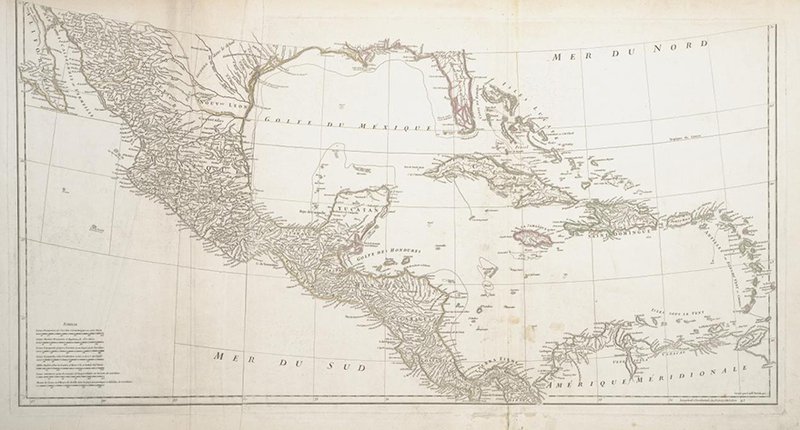 by Young & Dellecker, in Edwin James, Account of an Expedition from Pittsburgh to the Rocky Mountains (Philadelphia: Carey & Lea, 1823), atlas. 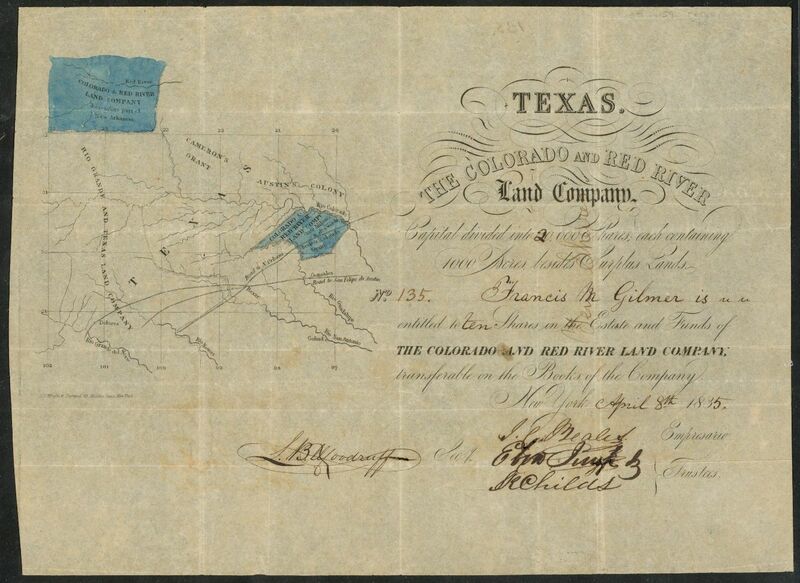 Note: This certificate is associated with a map. 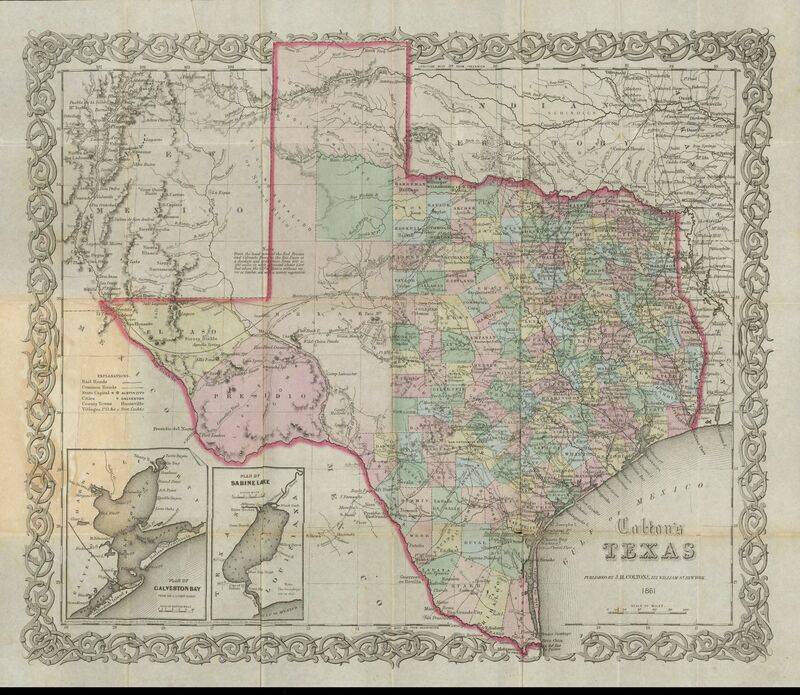 Note: This map is associated with a certificate. 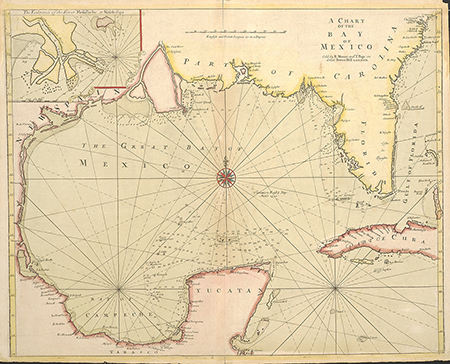 Size: 29 x 41 in. 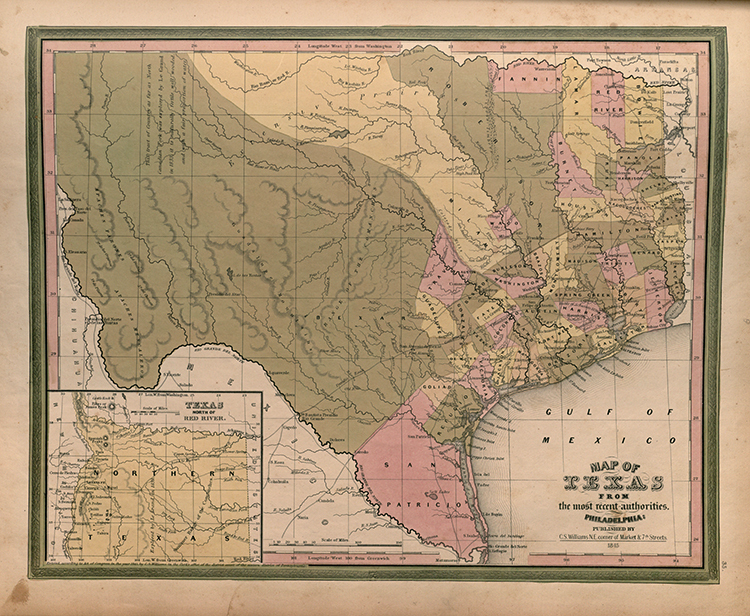 Citation: J. H. Colton and Co. Texas. 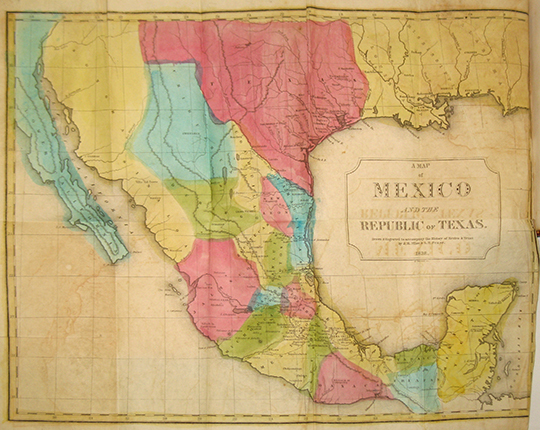 color lithograph, 33 x 41 cm.,1855 (with revisions to 1856), probably from Colton's Atlas of the World. 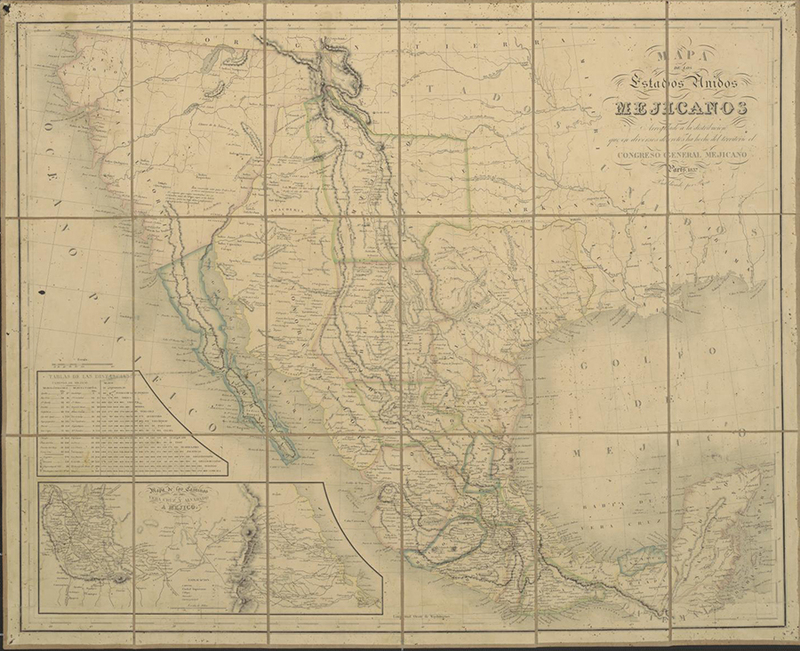 (New York: J. H. Colton and Co., 1856), plate 35. 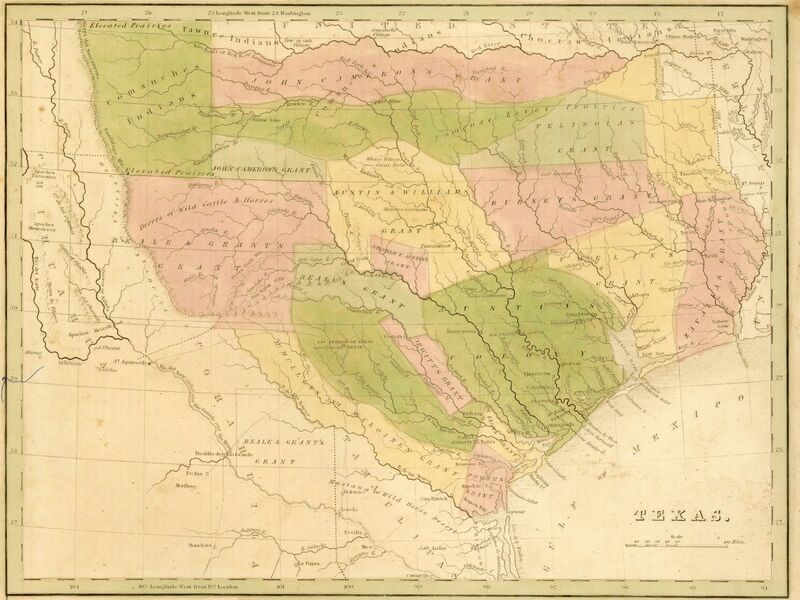 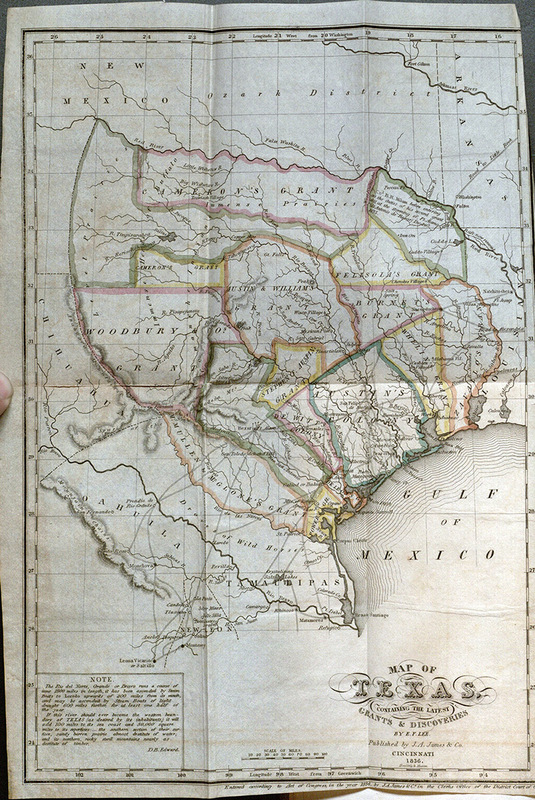 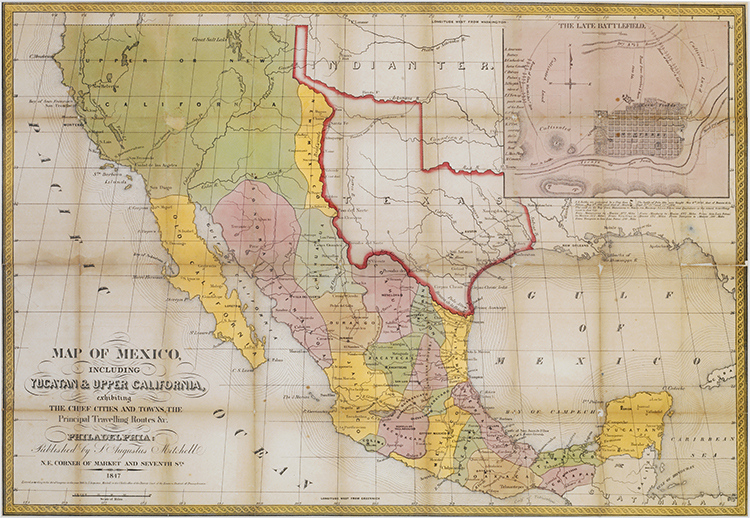 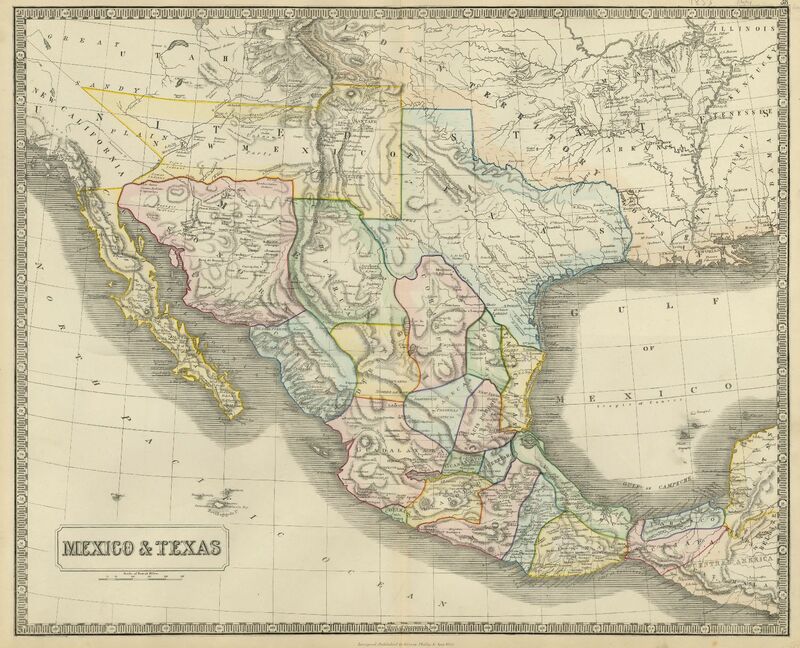 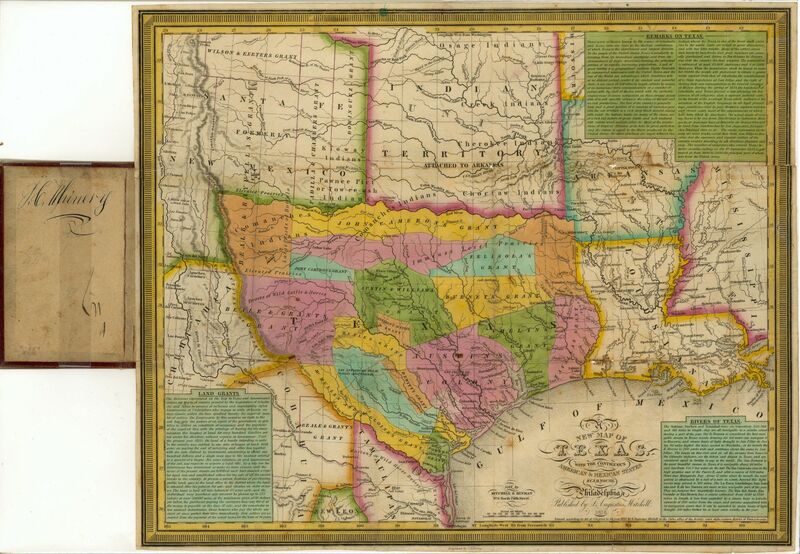 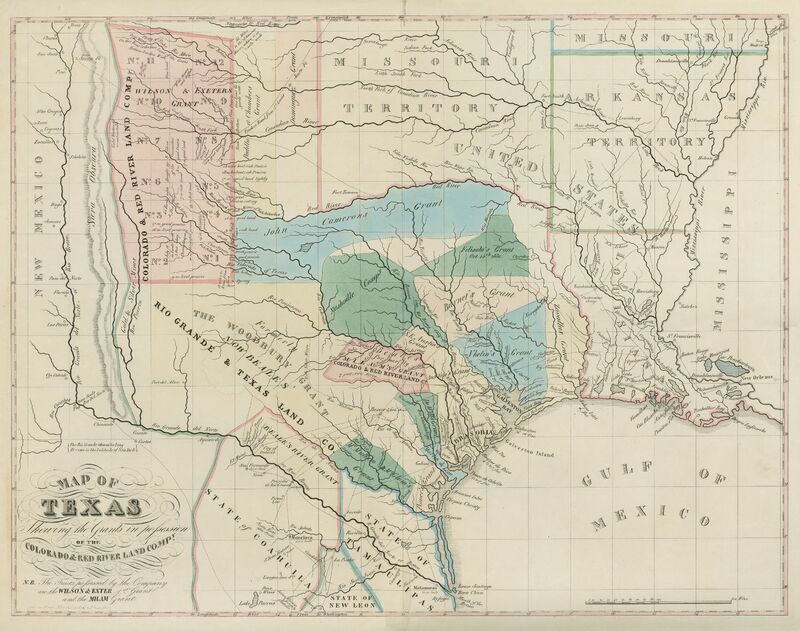 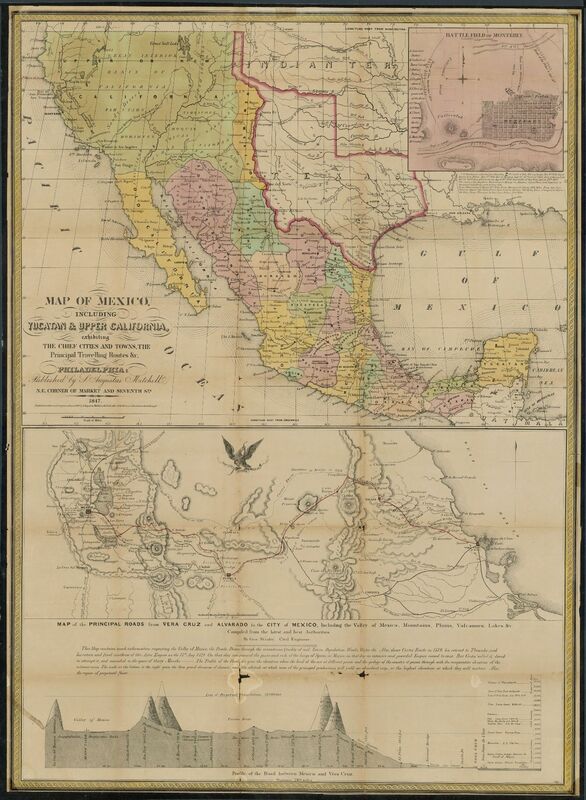 Citation: C. S. Richardson, Richardson's New Map of Texas including Part of Mexico. 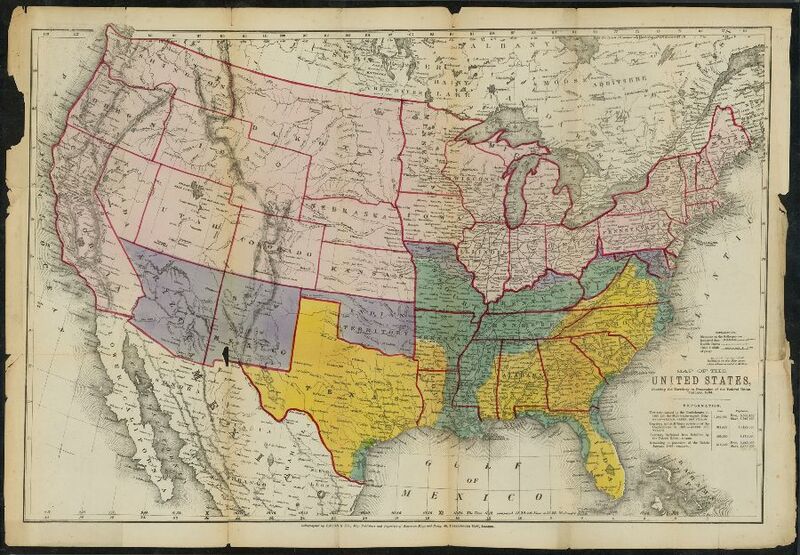 Philadelphia: Charles Desilver, 1861. 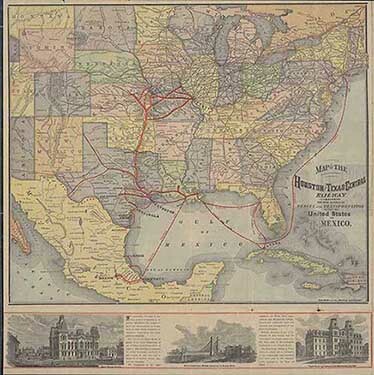 Citation: [Texas County Map with Route of the G.H.& S.A. Railway], chromolithograph, by August Gast & Co., St. Louis, in M. Whilldin, A Description of Western Texas (Galveston, Texas: Galveston, Harrisburg & San Antonio Railway Company, printed at “The News” Steam Book & Job Office, 1876). 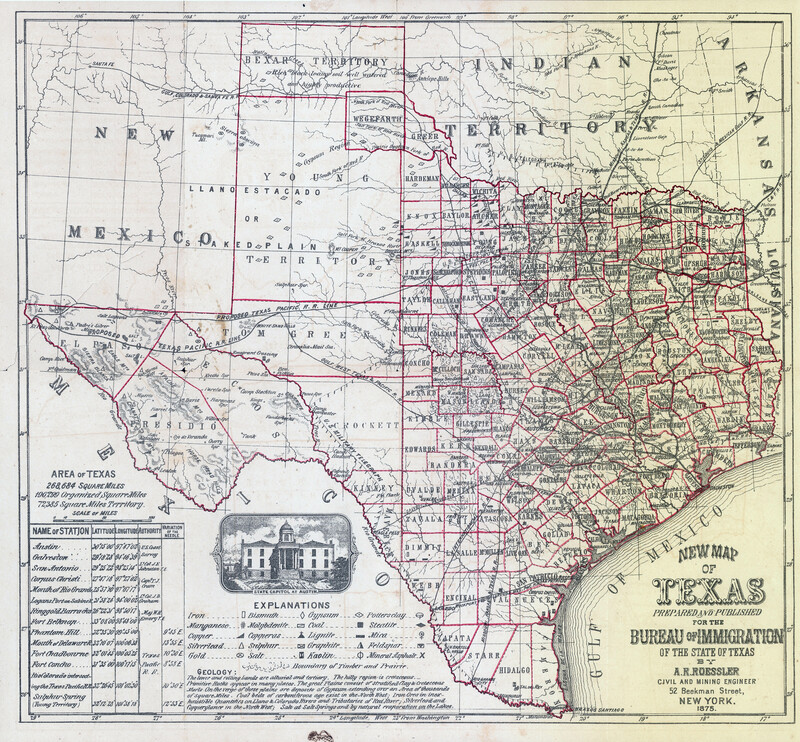 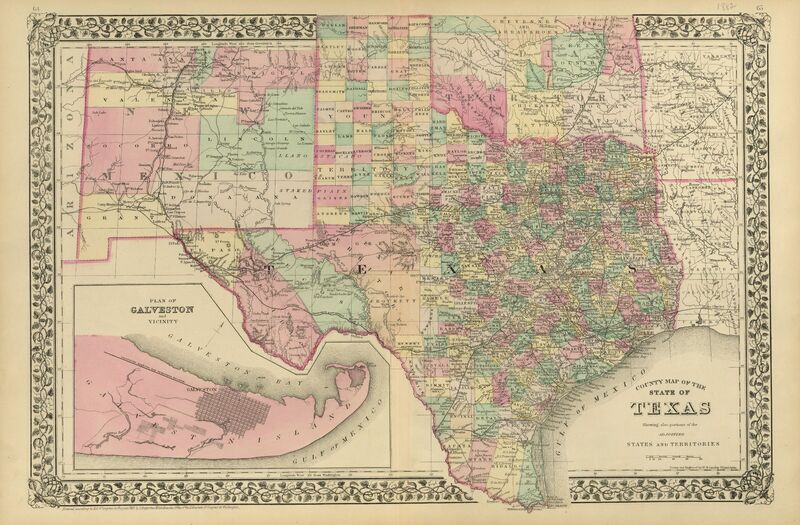 Citation: Correct Map of Texas, by Rand, Avery & Co., Boston, in M. Whilldin, A Description of Western Texas (Galveston, Texas: Galveston, Harrisburg & San Antonio Railway Company, printed at “The News” Steam Book & Job Office, 1876). .
Citation: Gray, Frank A. 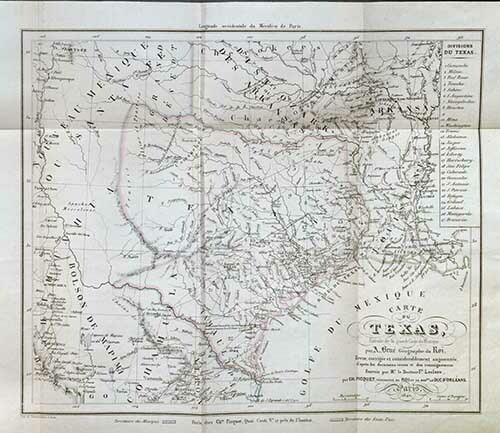 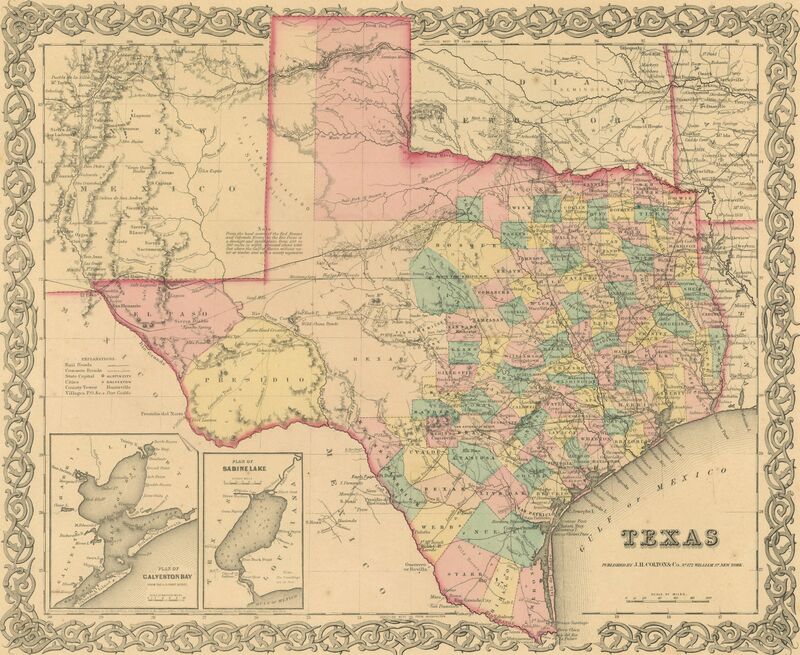 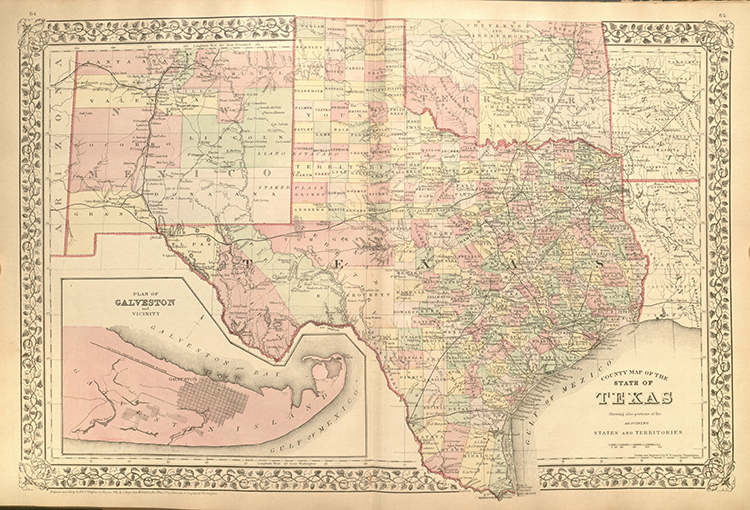 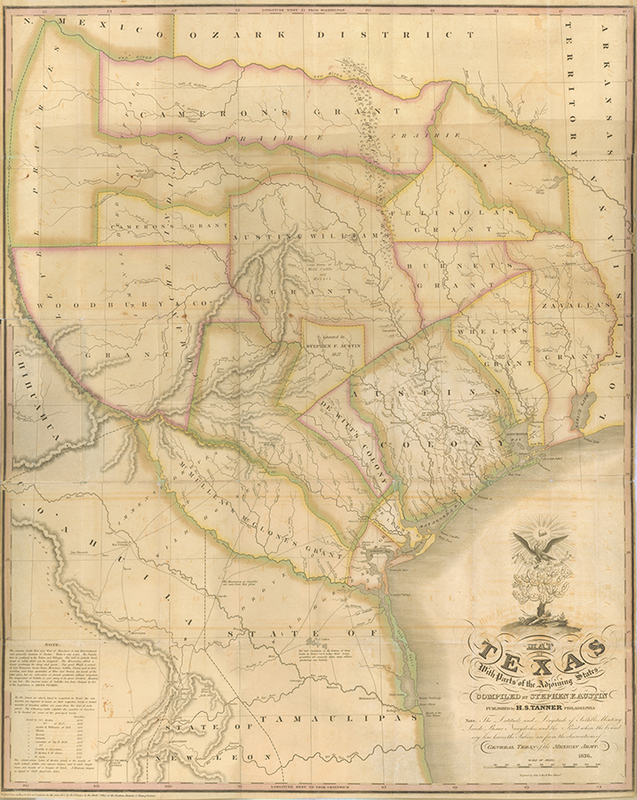 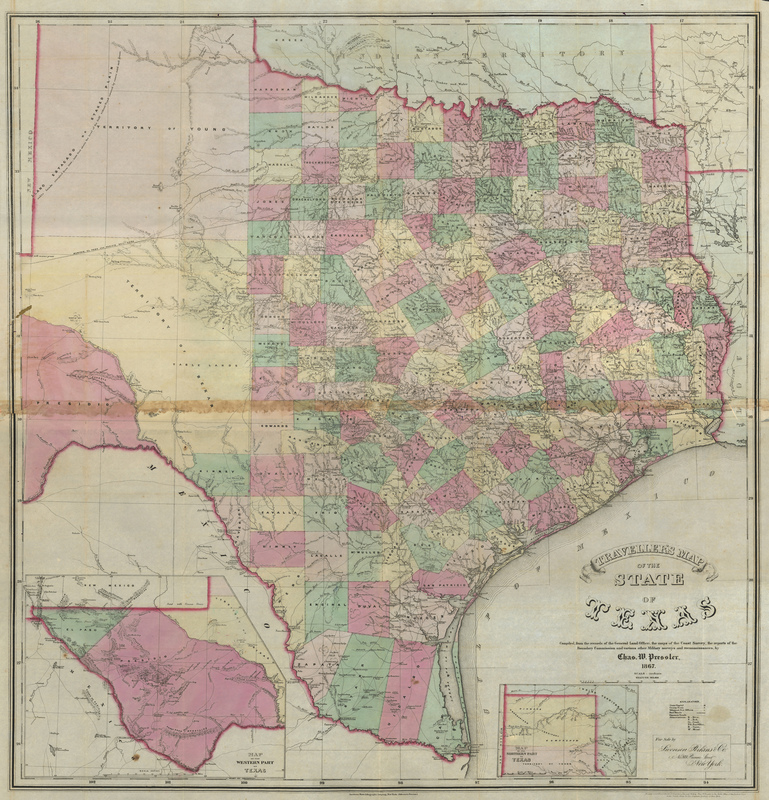 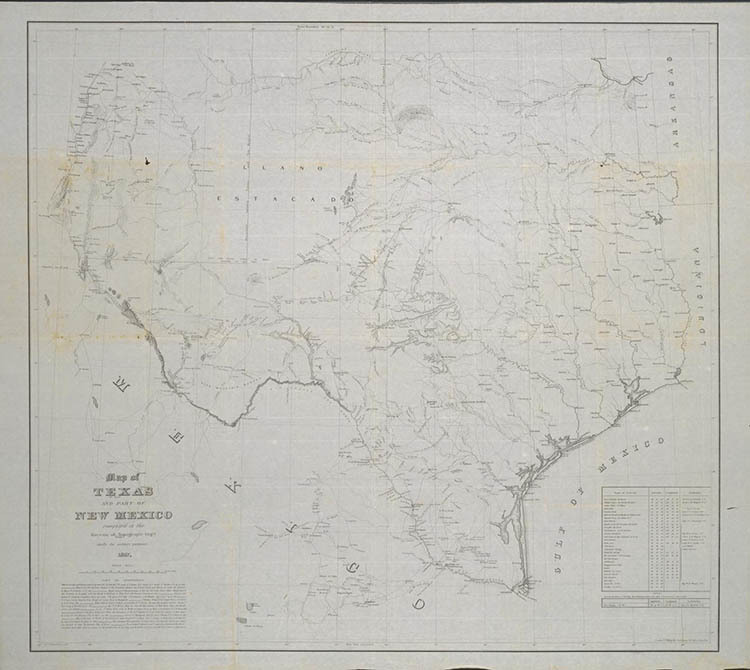 Gray's New Map of Texas and Indian Territory. 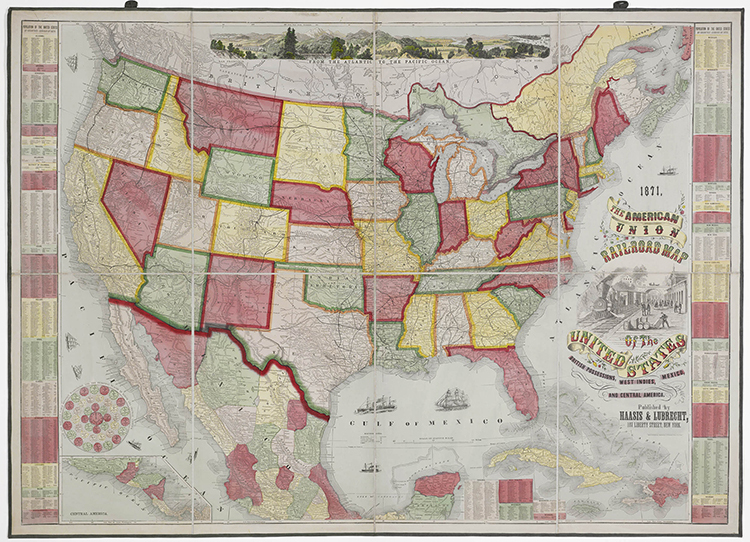 Philadelphia: O. W. Gray and Son, 1876. 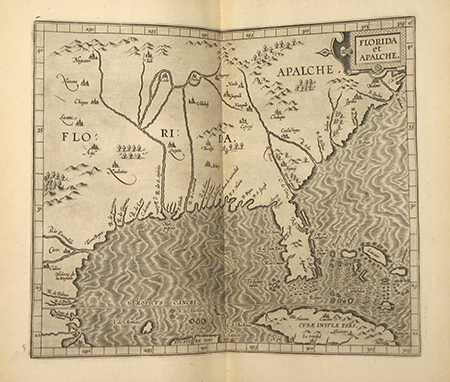 Citation: Williams, H.T. 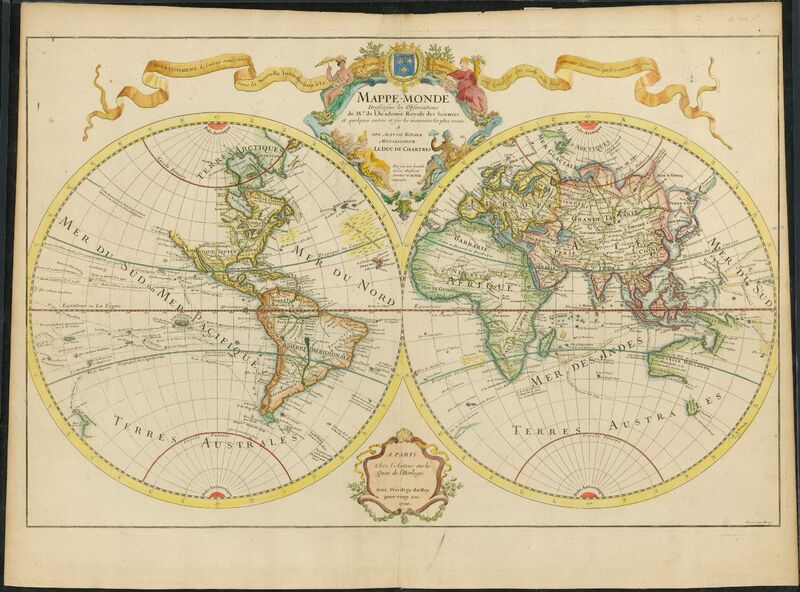 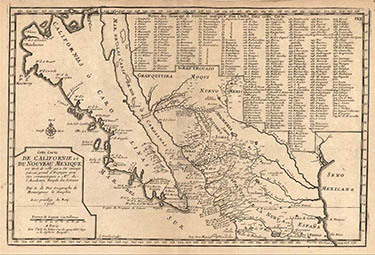 Williams' New Trans-Continental Map of the Pacific R.R. 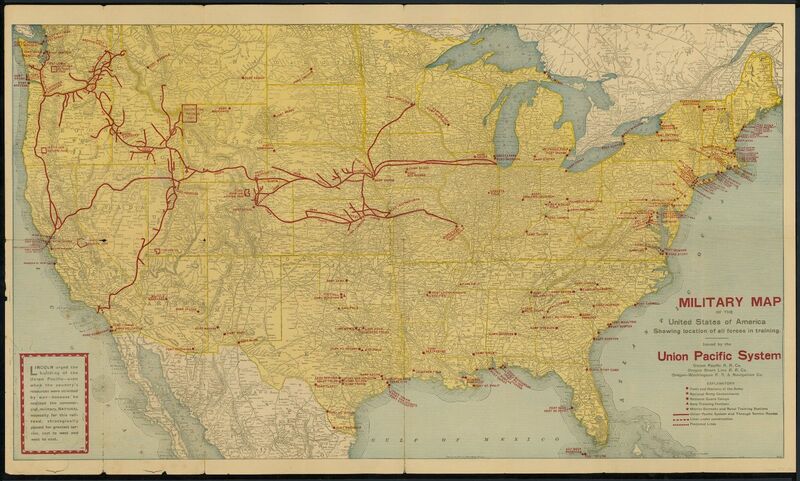 and Routes of Overland Travel to Colorado, Nebraska, The Black Hills, Utah, Idaho, Nevada, Montana, California and the Pacific Coast. 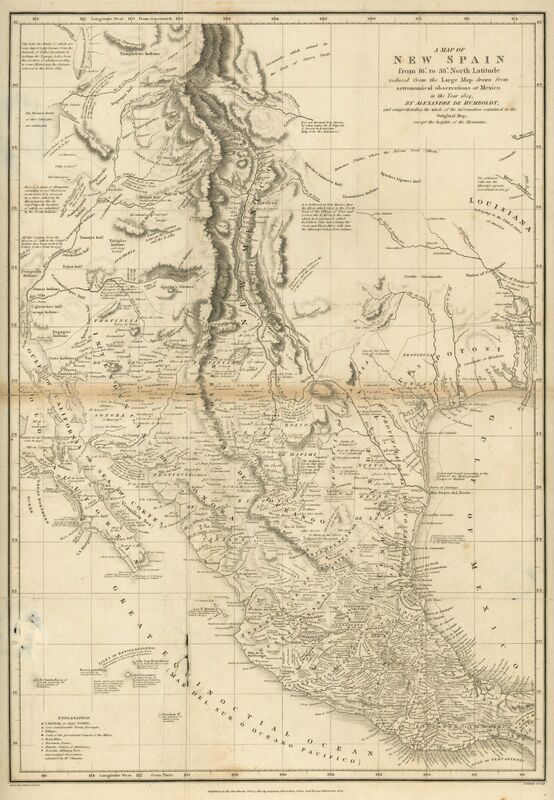 New York: Adam & Bishop, 1877. 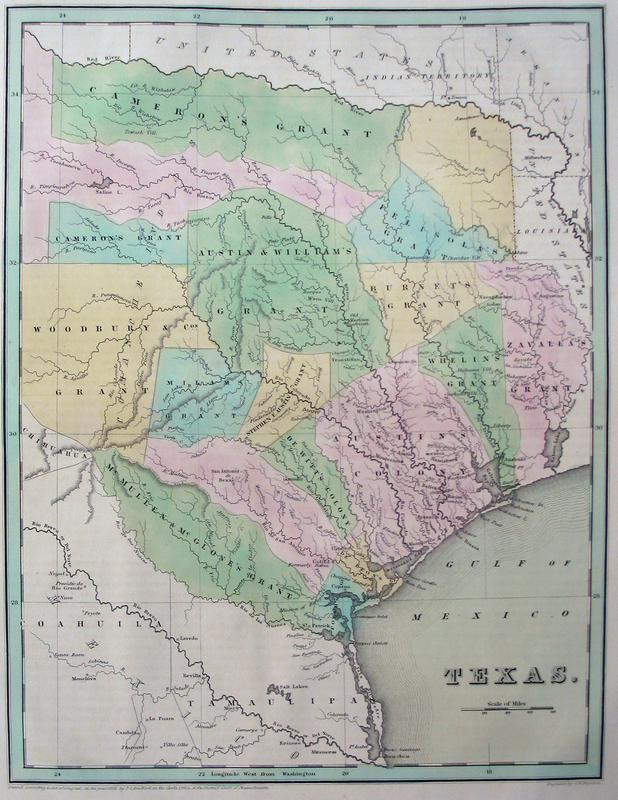 Citation: Correct Map of Texas. 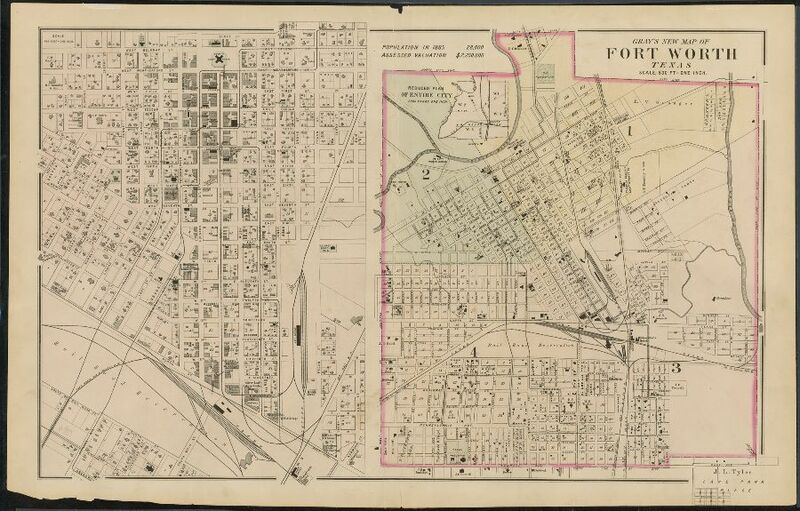 St. Louis: Woodward, Tiernan & Hale, 1878. 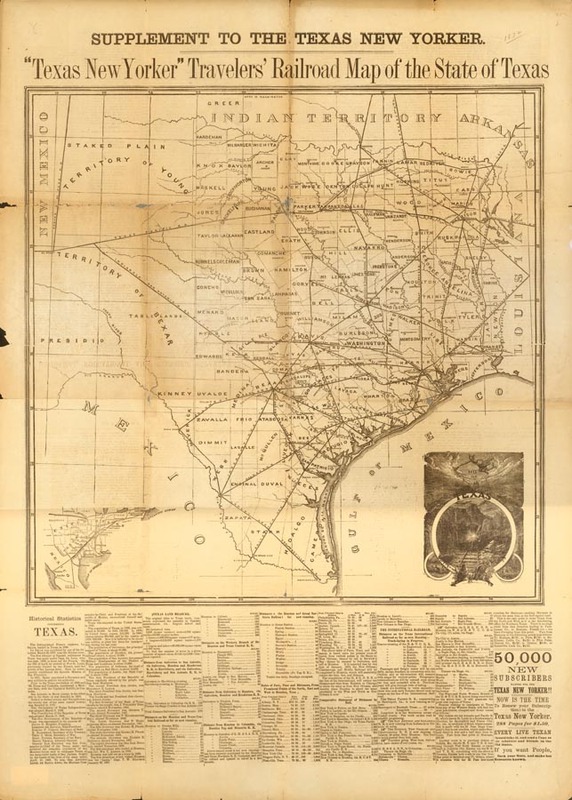 Citation: The Texas and Pacific Railway: the Shortest Line to the Great Cotton, Grain and Stock Regions of Texas. 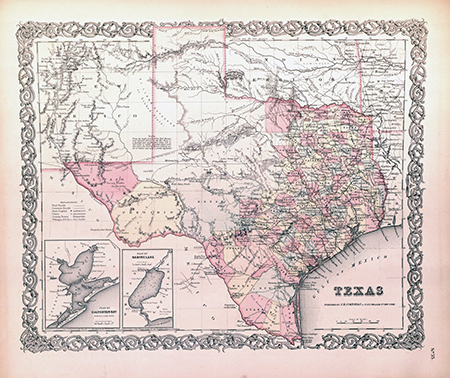 A Geographically Correct Map of the State of Texas Published by the Texas & Pacific Railway Company St. Louis: Woodward, Tiernan & Hale, 1878. 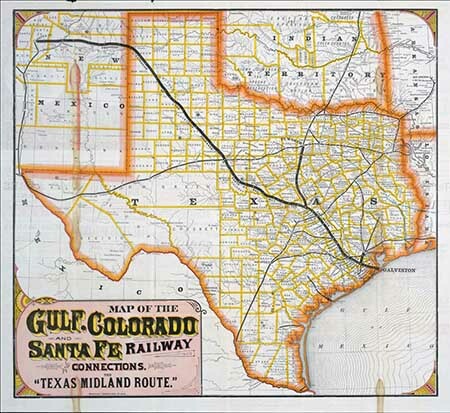 Citation: Map of the Gulf, Colorado and Santa Fe Railway and Connections. 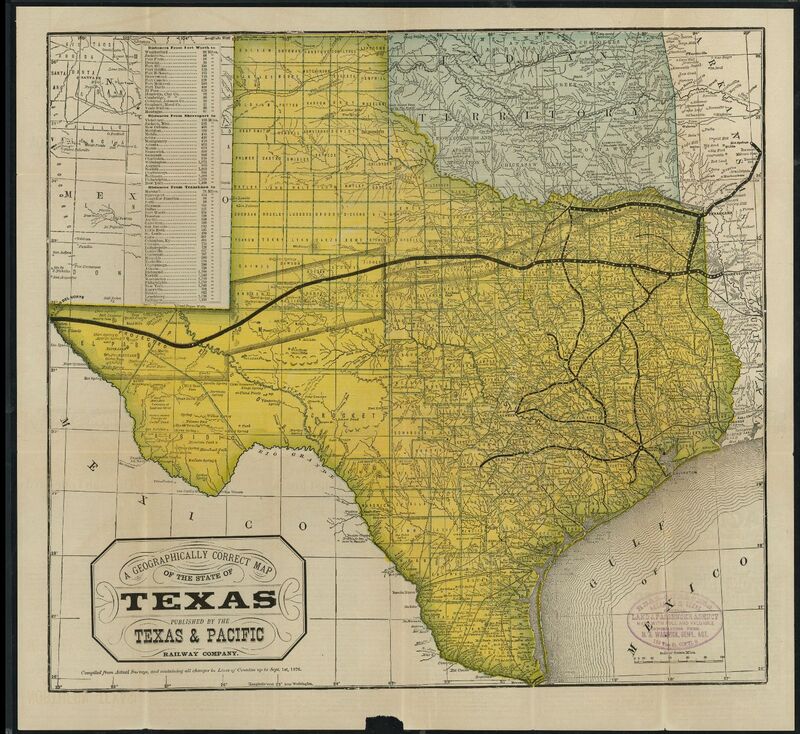 The "Texas Midland Route." 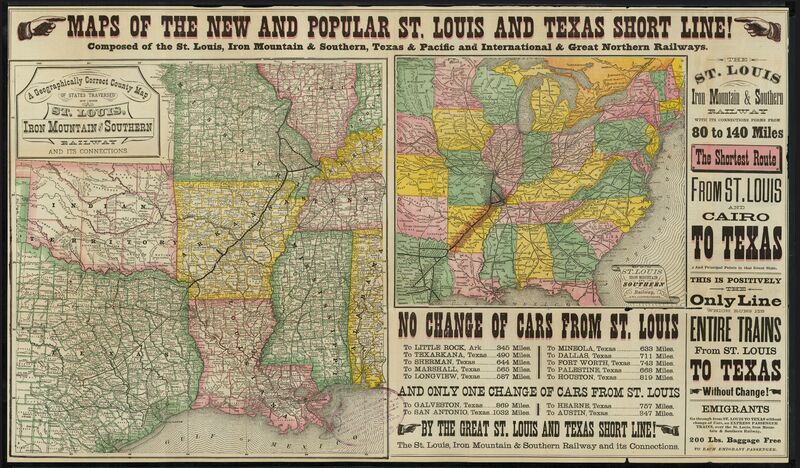 Printed by Woodward, Tiernan & Hale, St. Louis, 1880. 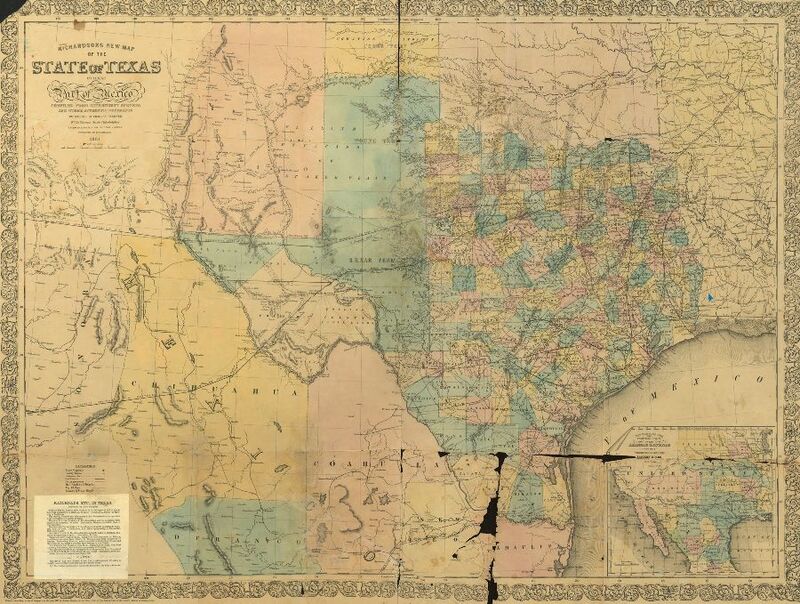 The University of Texas at Arlington Libraries Special Collections. 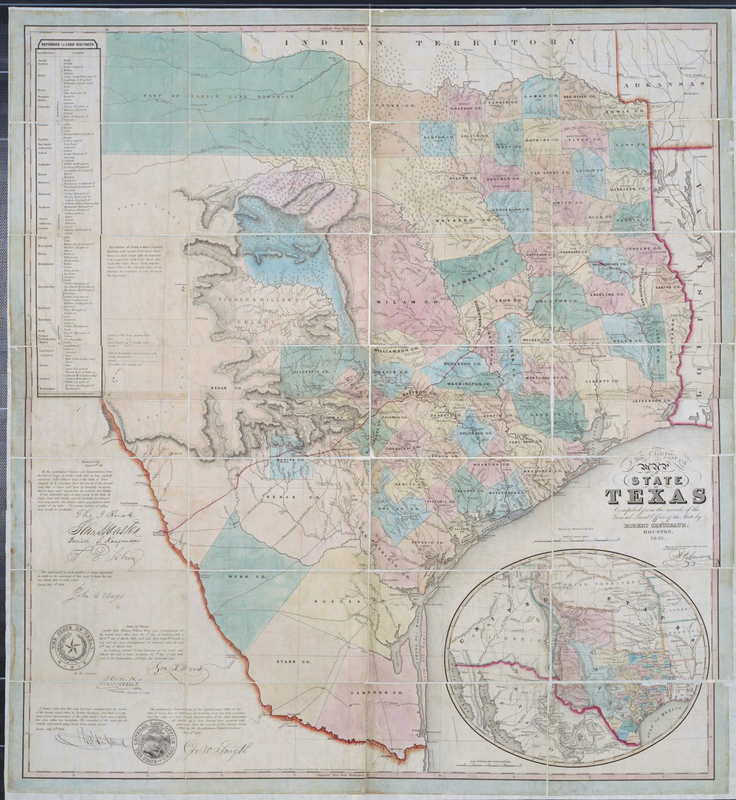 Citation: Gamble, W. H. County Map of the State of Texas Showing also Portions of the Adjoining States and Territories. 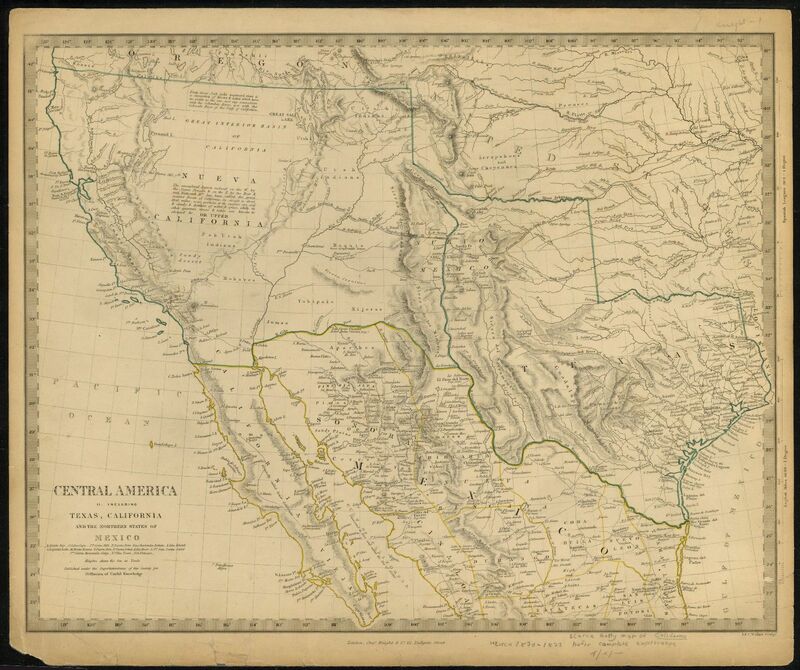 Philadelphia: S. A. Mitchell, 1881. 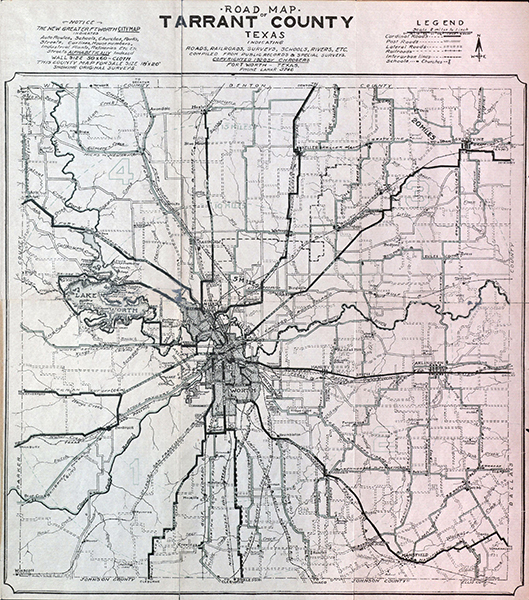 Citation: A Geographically Correct County Map of the States Traversed by the St. Louis, Iron Mountain and Southern Railway and its Connections. 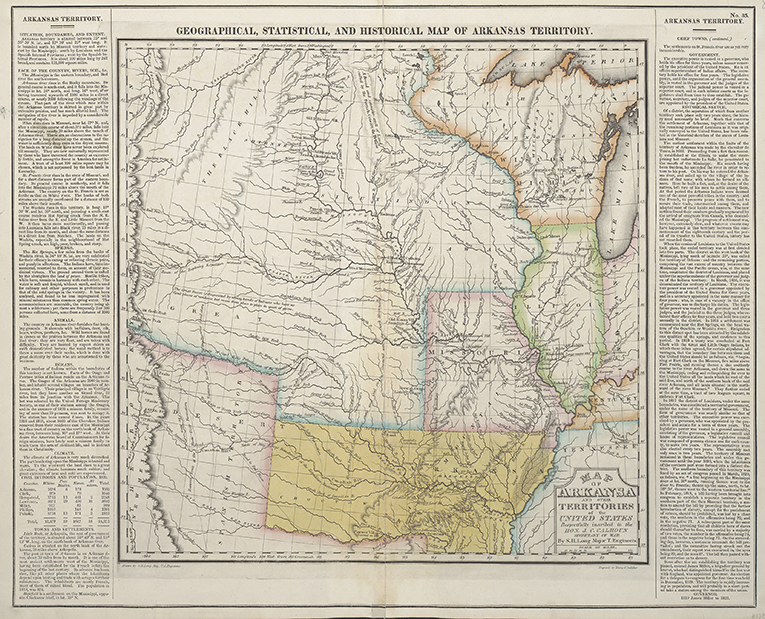 St. Louis: Wooward, Tiernan & Hale, 1882. 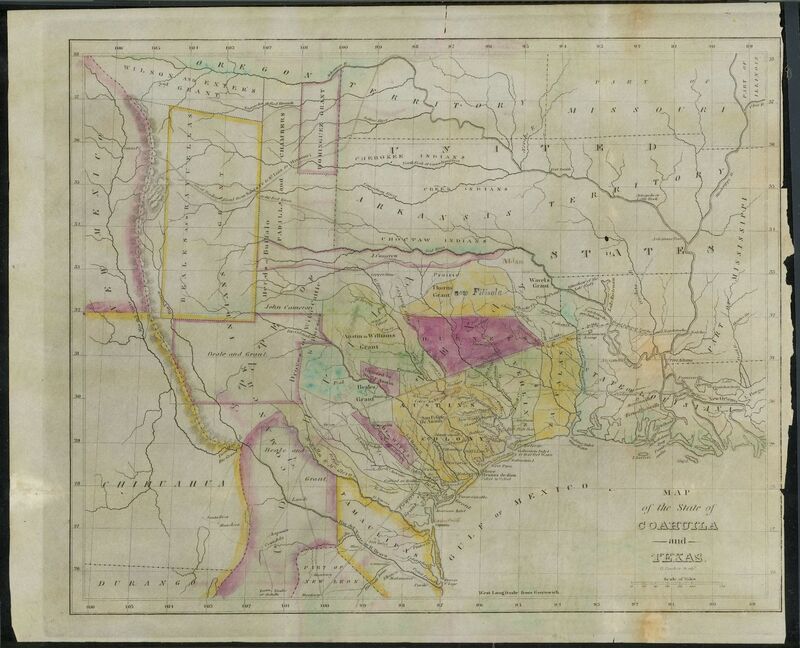 Citation: Gray's New Map of Brenham, Washington Co., Texas. 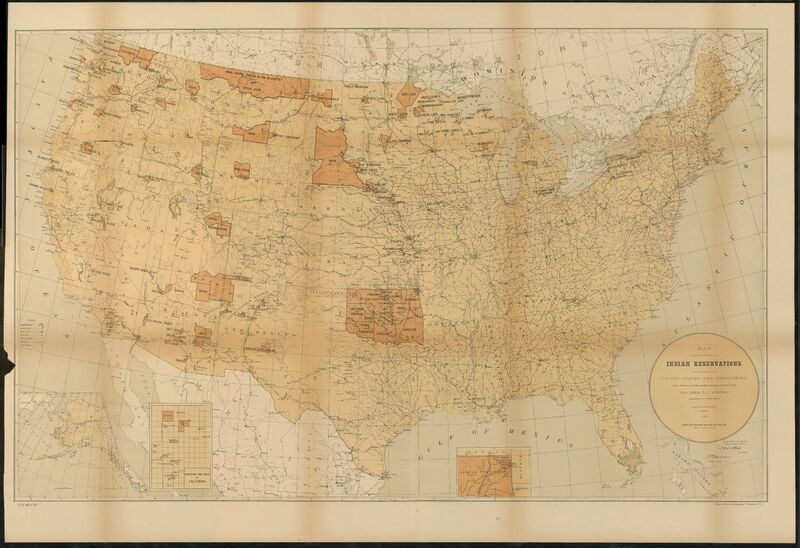 Philadelphia: O. W. Gray & Son, ca.1885. 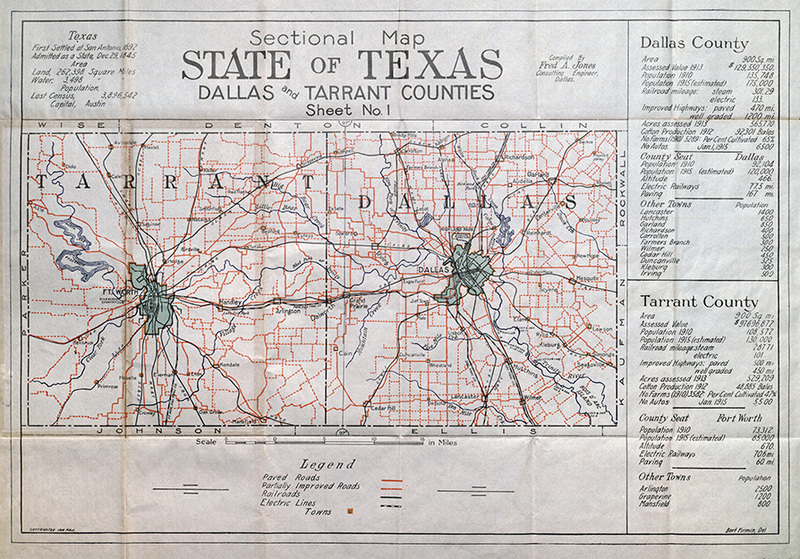 Citation: Gray's Map of Fort Worth, Texas. 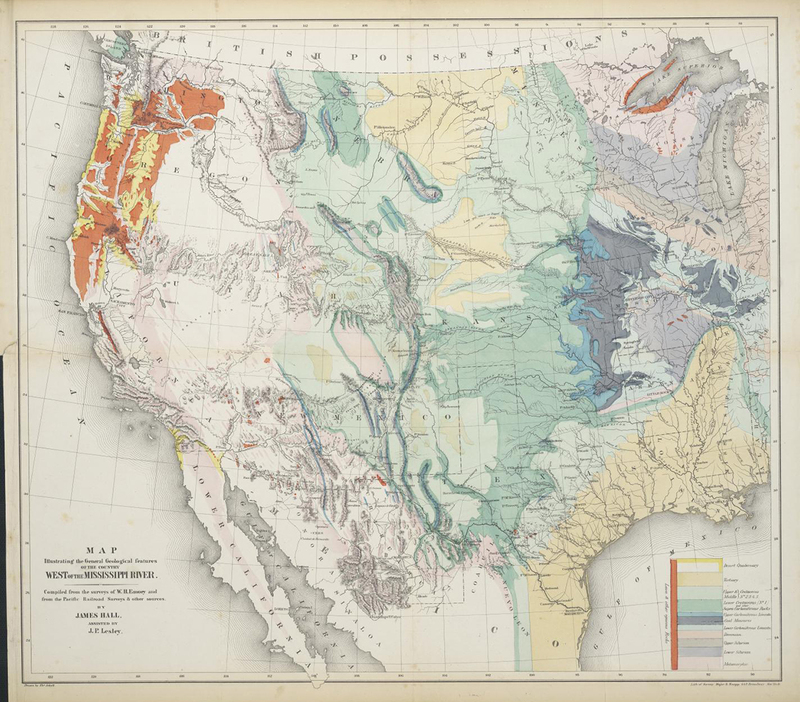 Philadelphia: O. W. Gray & Son, 1885. 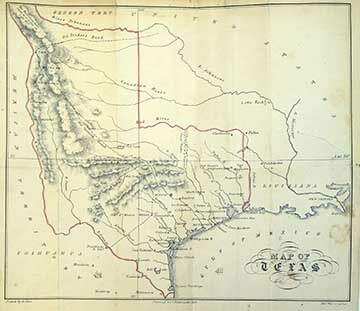 Citation: Gray's New Map of Weatherford, Parker Co., Texas. 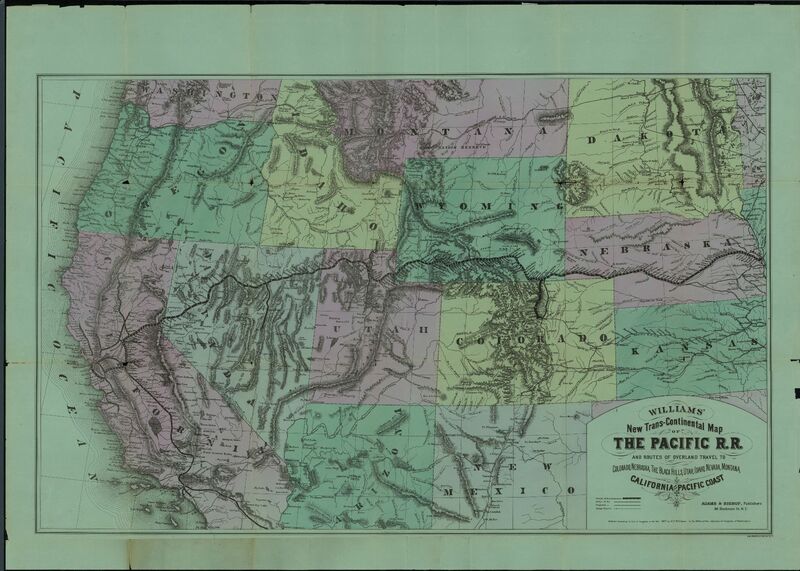 Philadelphia: O. W. Gray & Son, 1885. 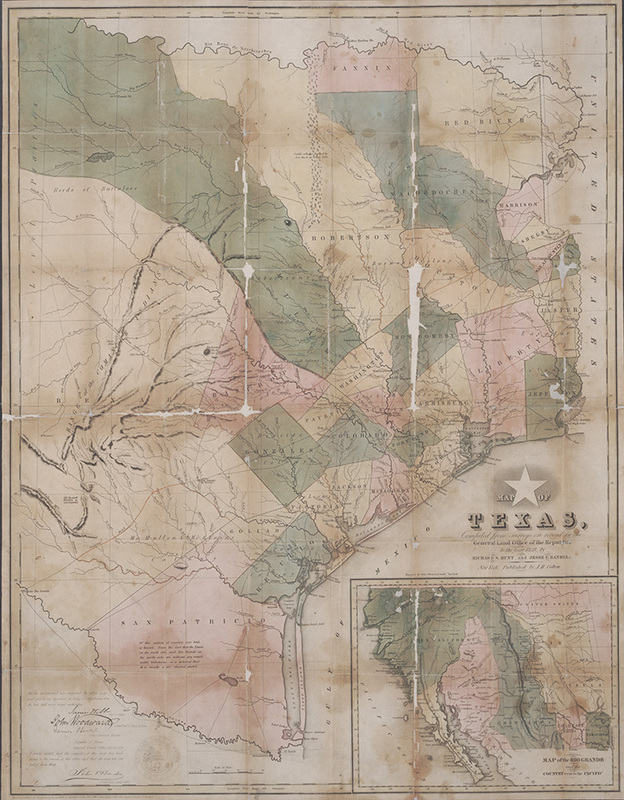 Citation: Gray's New Map of Cisco, Eastland Co., Texas. 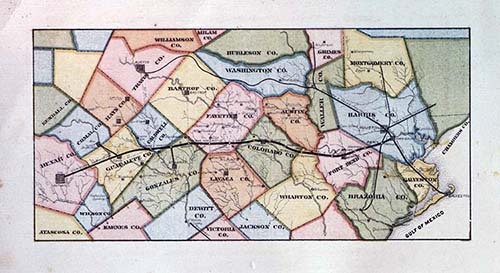 Philadelphia: O. W. Gray & Son, 1885. 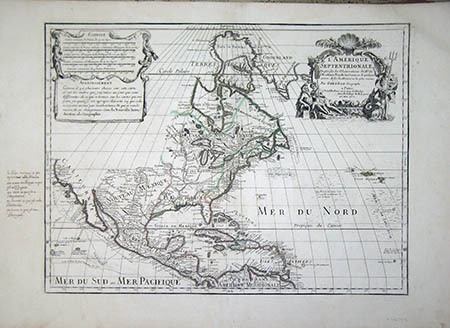 Citation: Brodie, Paul. 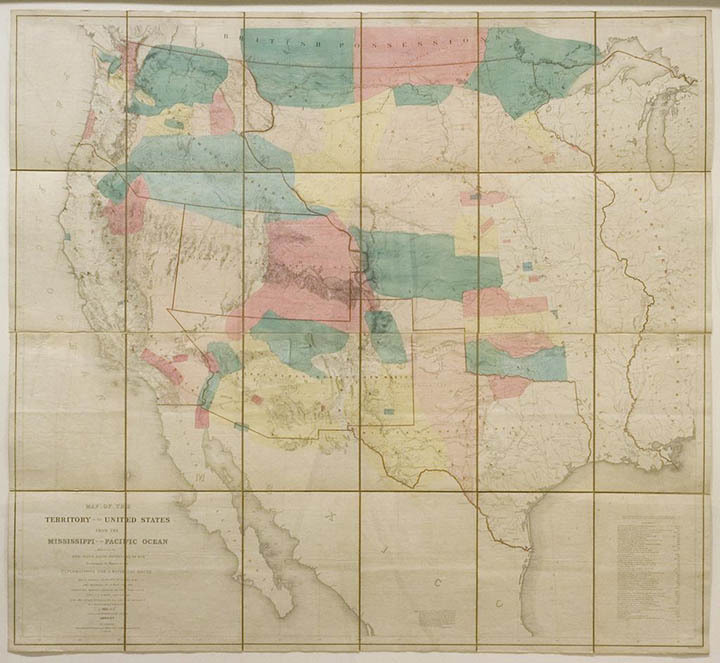 Map Showing the Location of the Indian Reservations within the Limits of the United States and Territories. 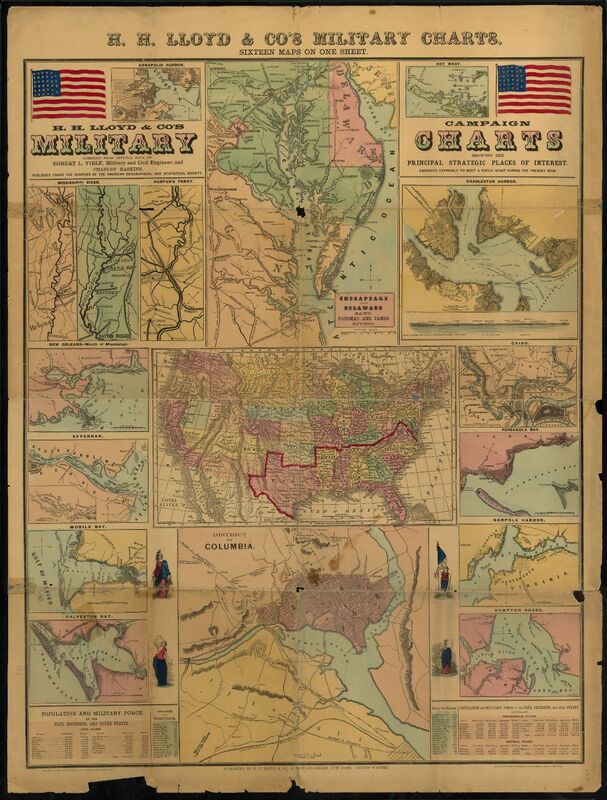 Washington, D. C.: U. S. Dept. 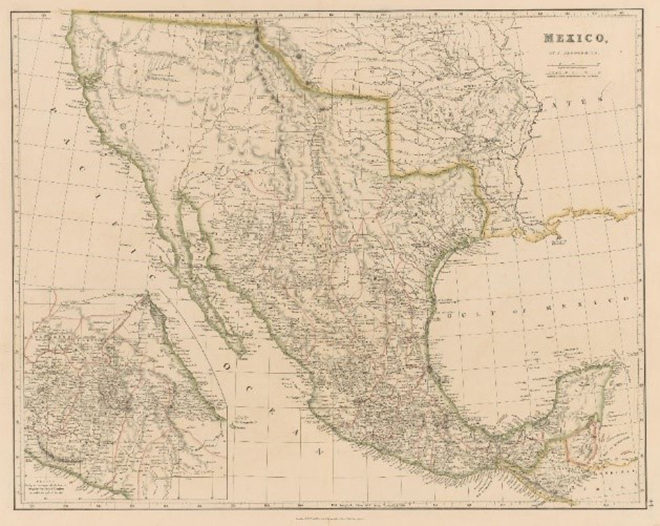 of the Interior, 1885. 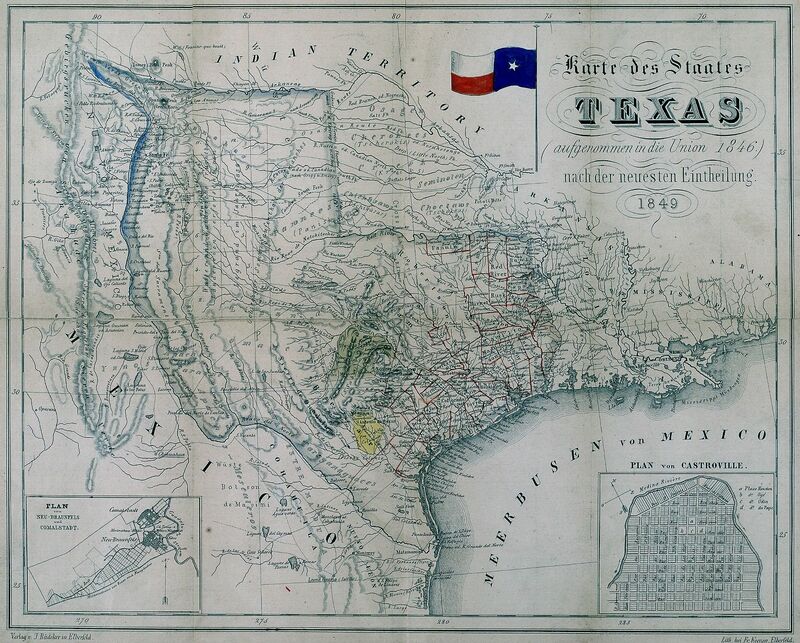 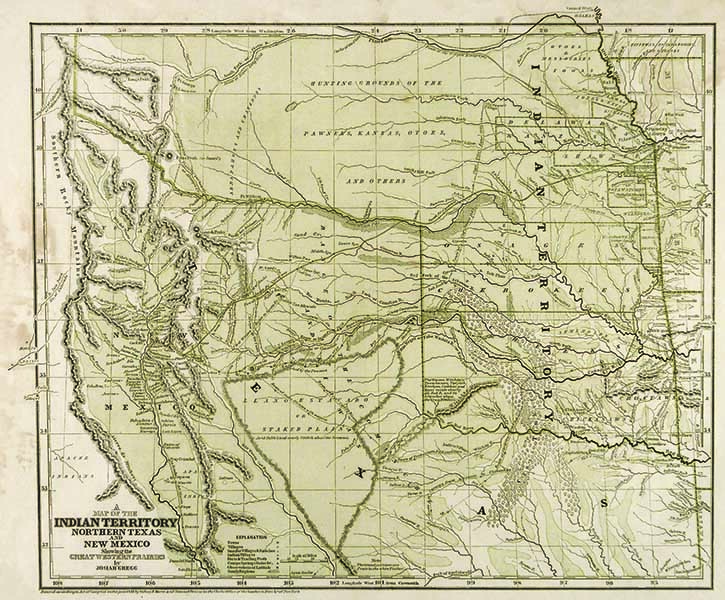 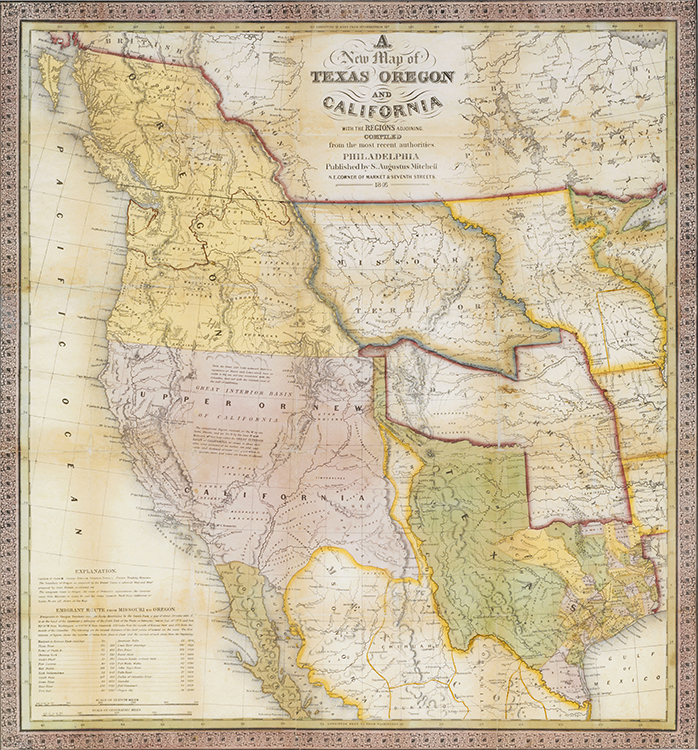 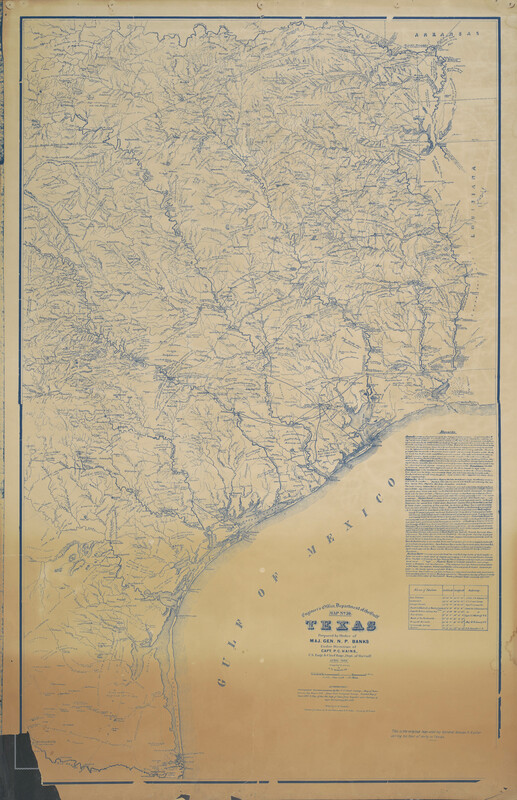 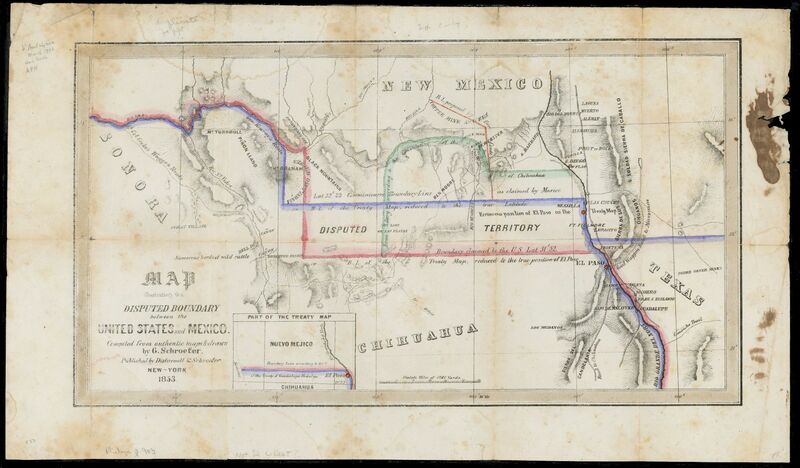 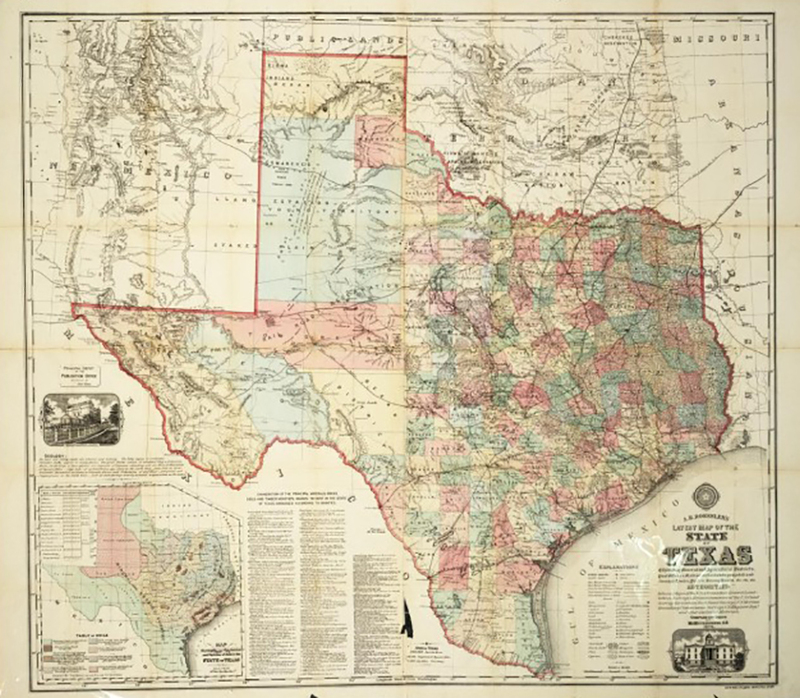 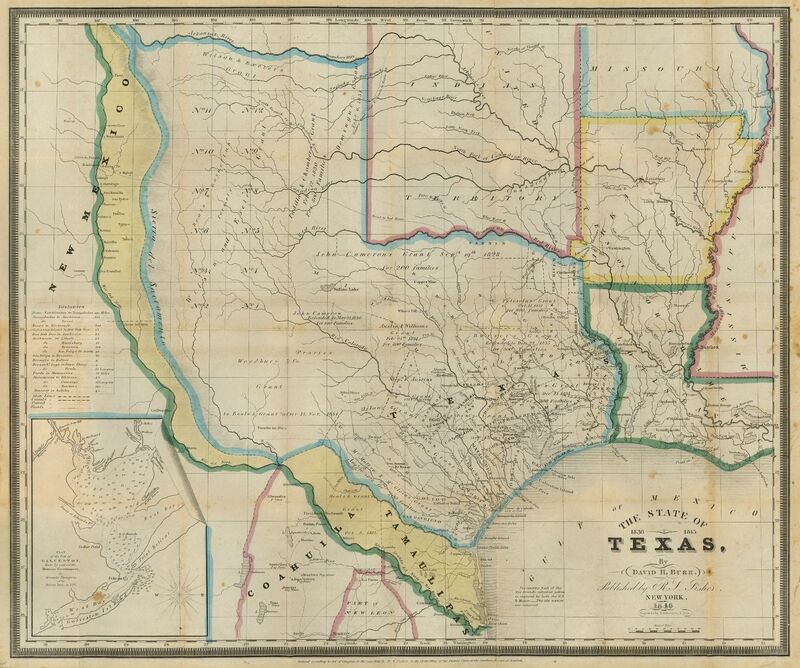 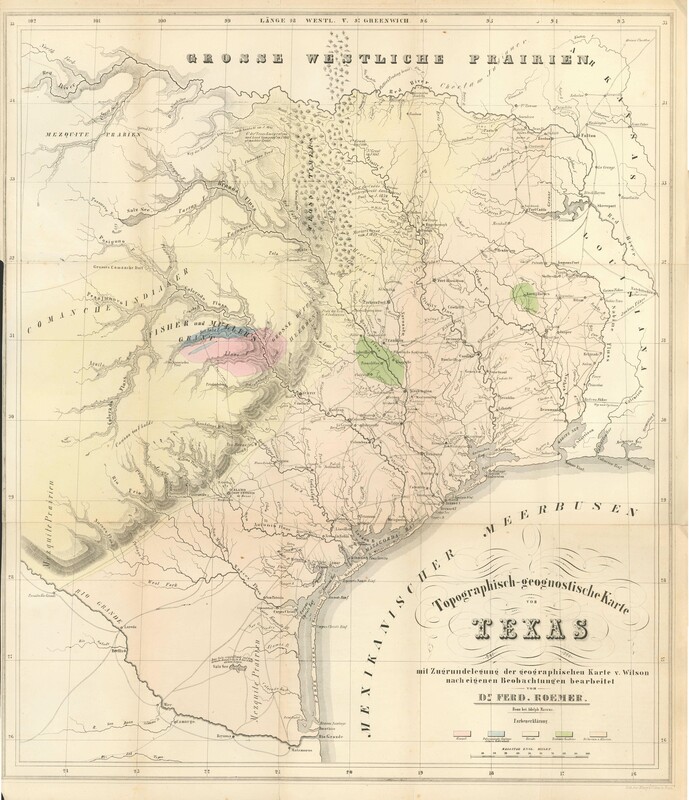 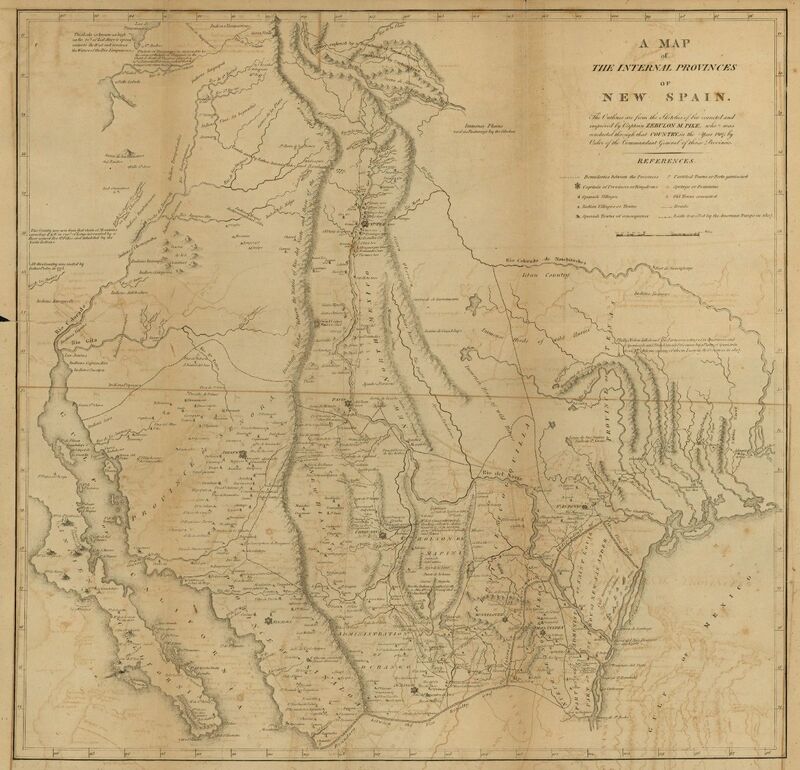 Citation: United States Army Bureau of Topographic Engineers.. Map of Texas and Part of New Mexico, 1857. 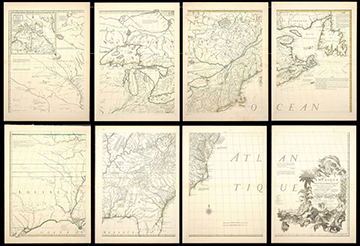 Washington, D.C.: Julius Bien & Co., 1887. 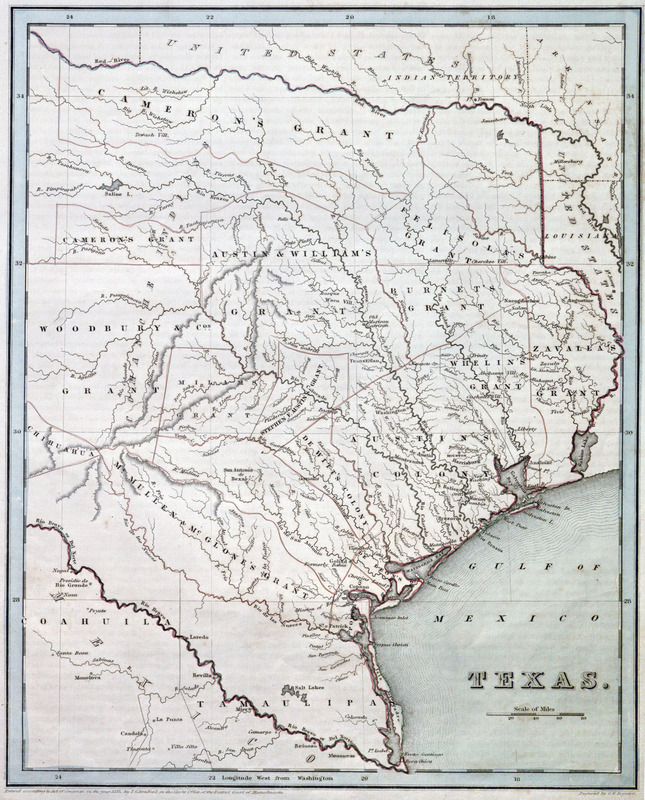 Citation: Map of Texas. 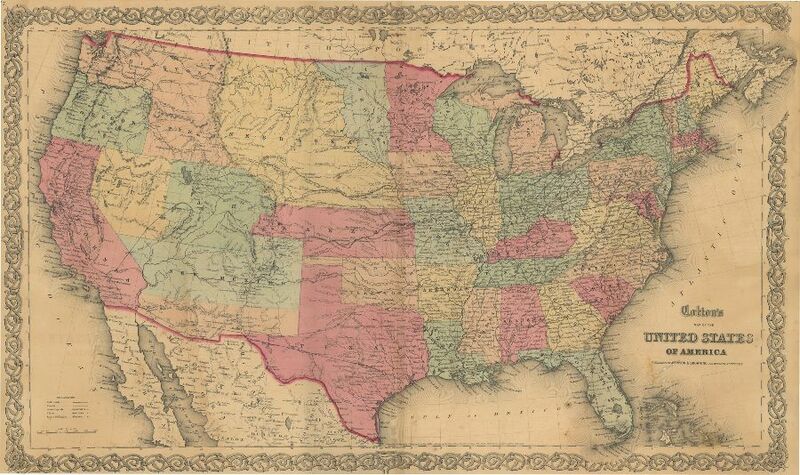 Chicago: Rand McNally & Co., 1889. 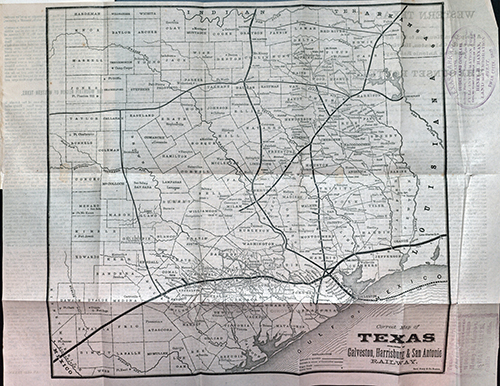 Citation: Sectional Map of Texas Traversed by the Missouri, Kansas & Texas Railway, Showing the crops adapted to each section, with the elevation and annual rainfall. 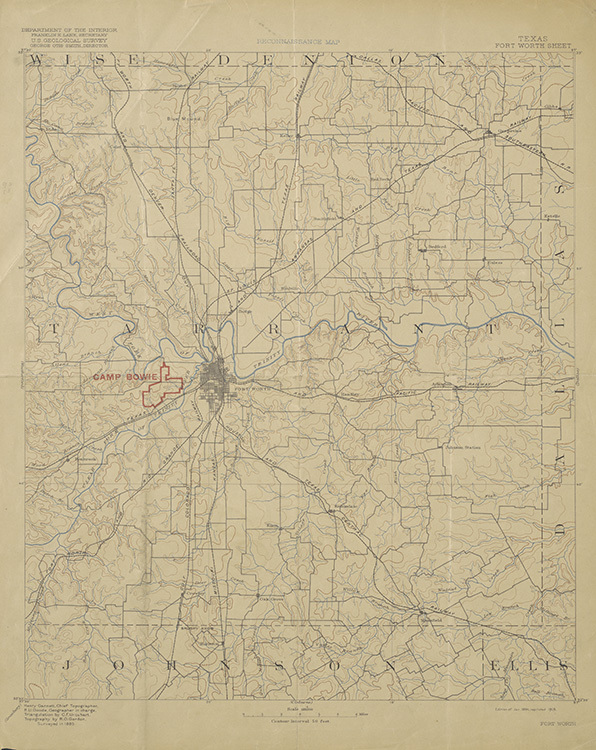 St. Louis: Parker Engraving Co., 1904. 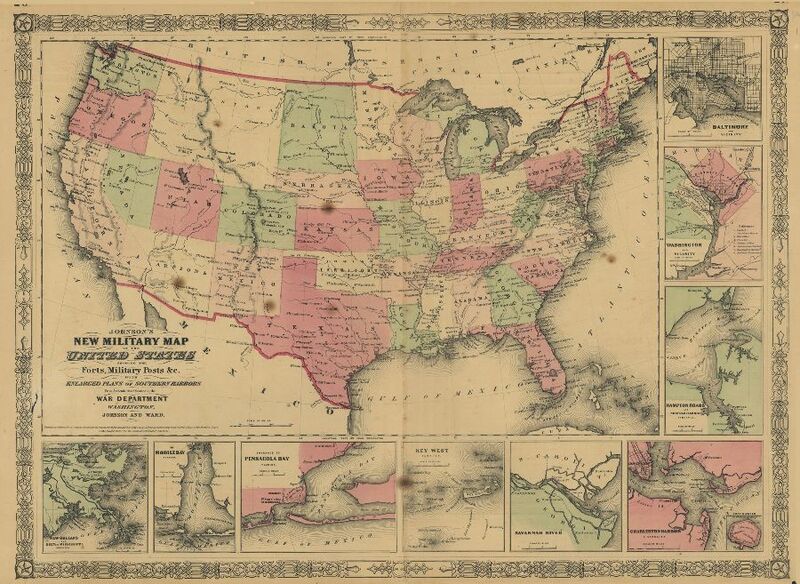 Citation: Military Map of the United States of America Showing Location of All Forces in Training. 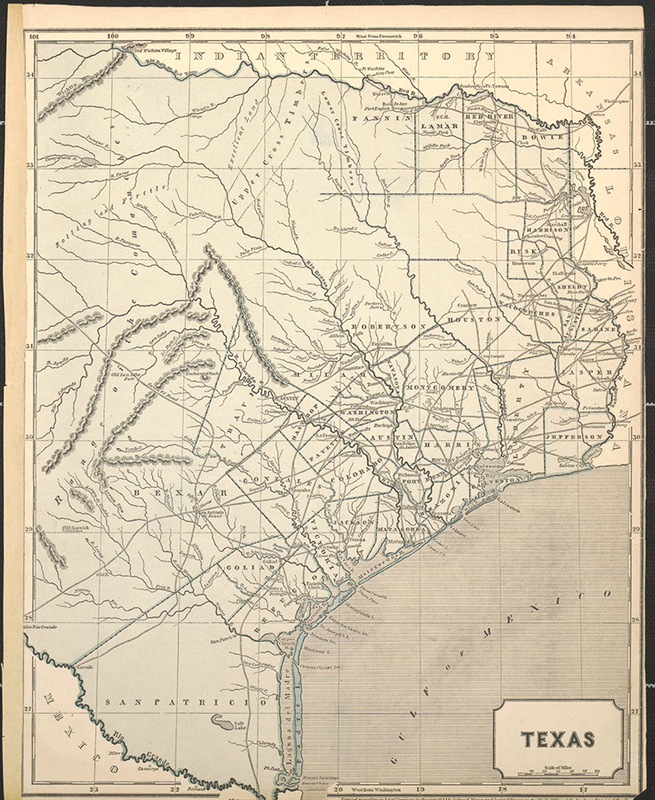 Chicago: Poole Bros., 1917. 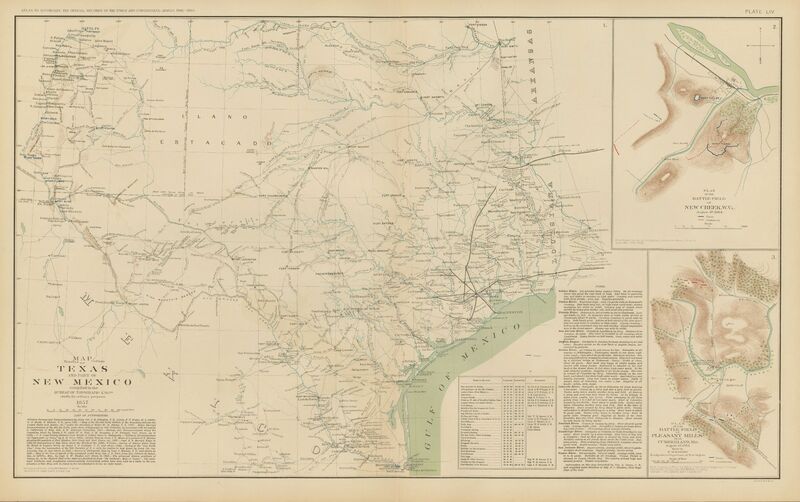 Citation: Mawson, C.O. 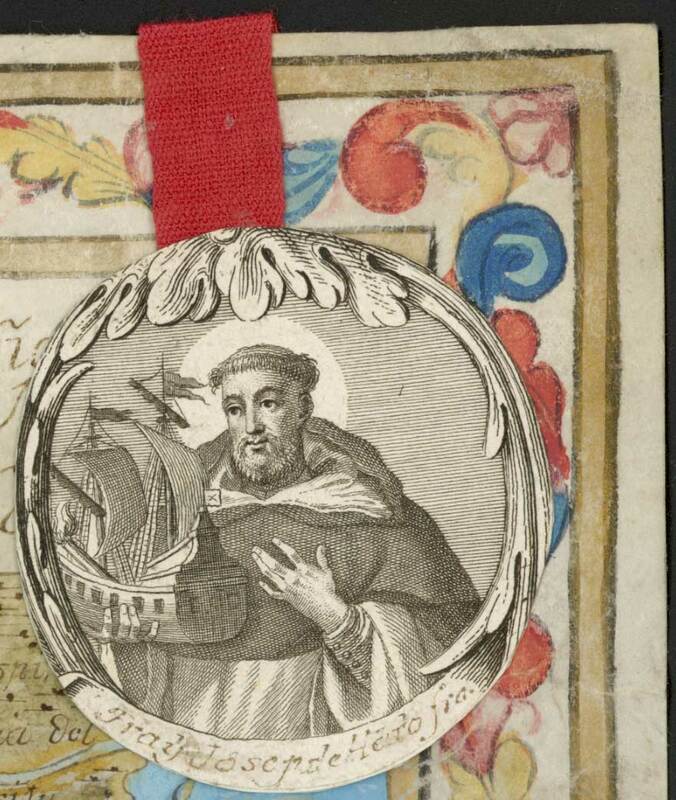 Sylvester. 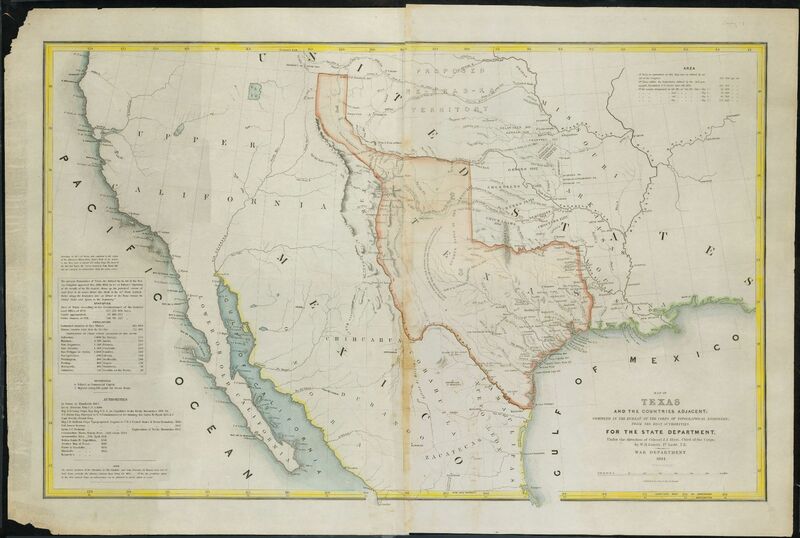 Texas in Doubleday, Page & Co's Geographical Manual and New Atlas. 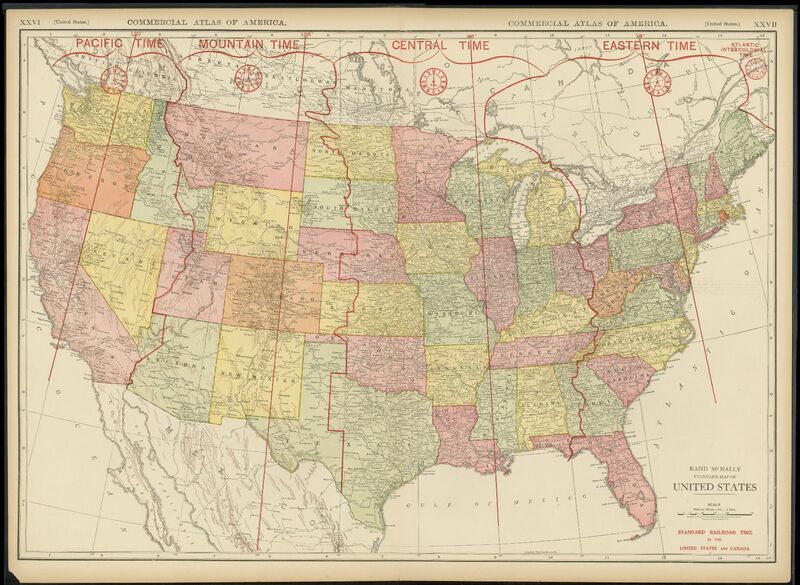 New York: Doubleday, page & Co., 1918. 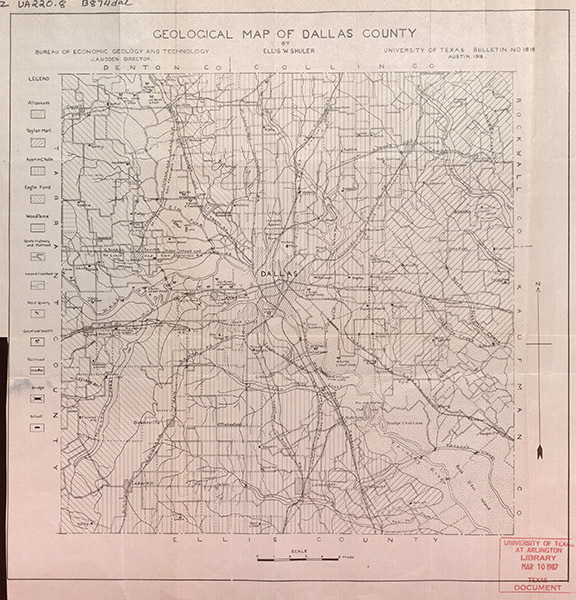 Citation: Ellis W. Shuler, Geological Map of Dallas County, lithograph from Bureau of Economic Geology and Technology, University of Texas Bulletin no. 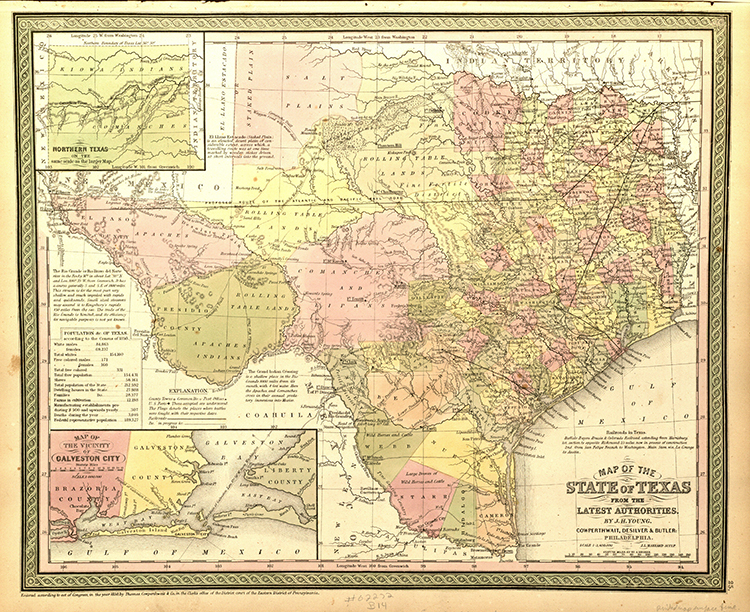 1818 (Austin, Texas: University of Texas, 1918). 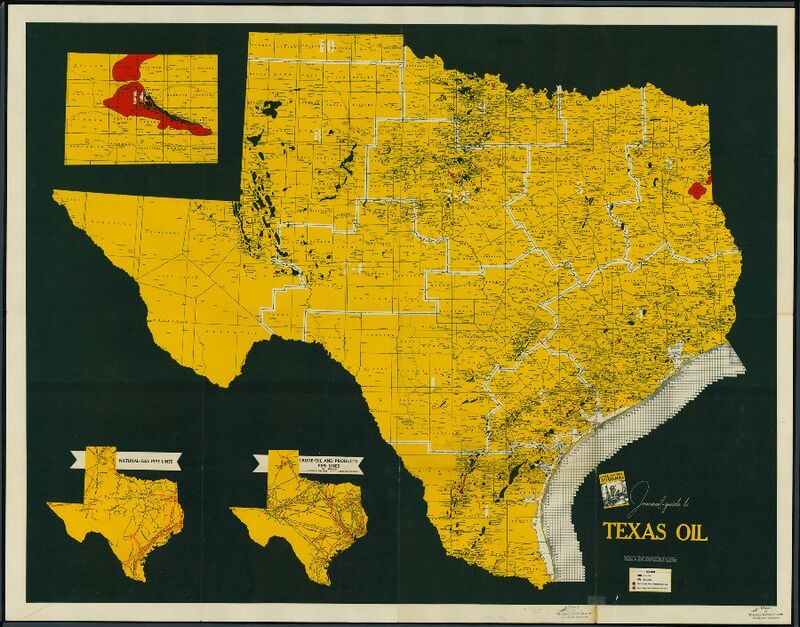 Citation: Oil Map of Callahan County. 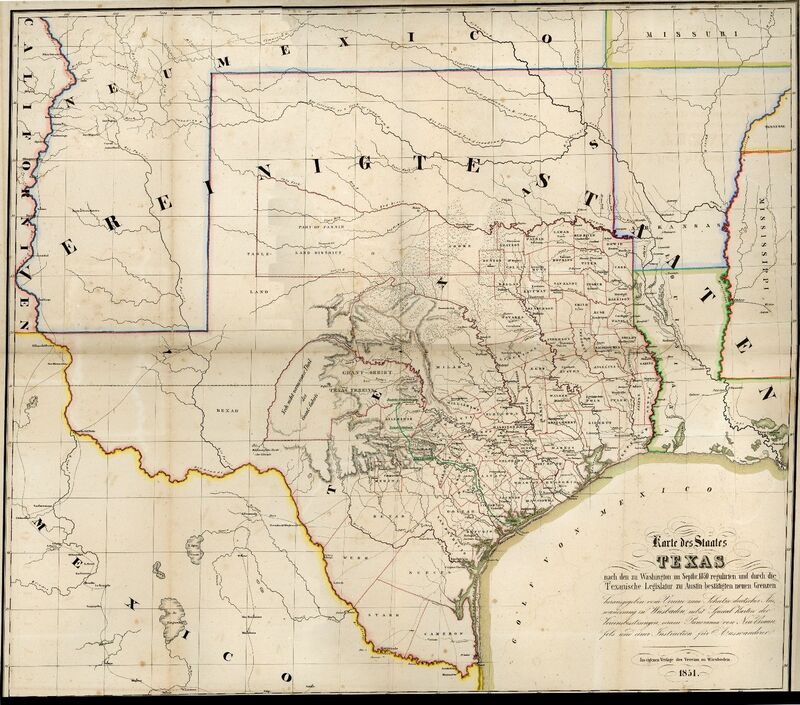 Baird, Tx. 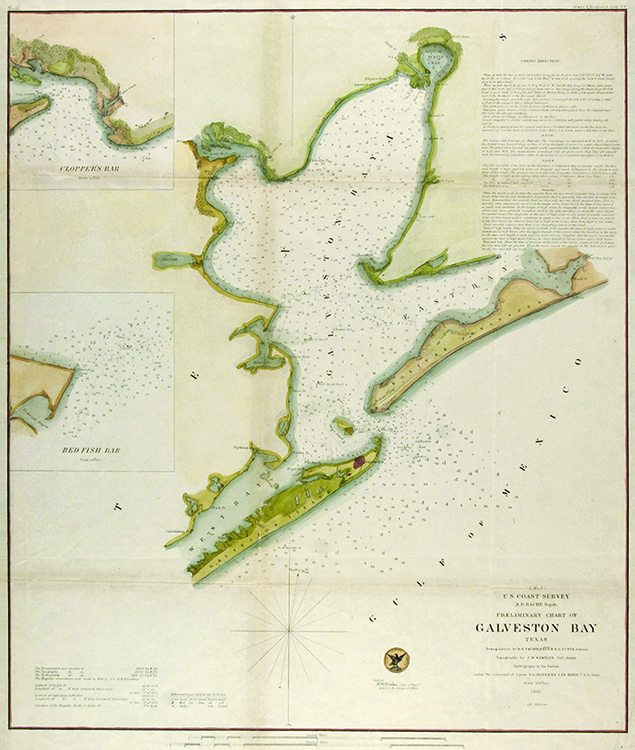 : Baird Commercial Club, 1919. 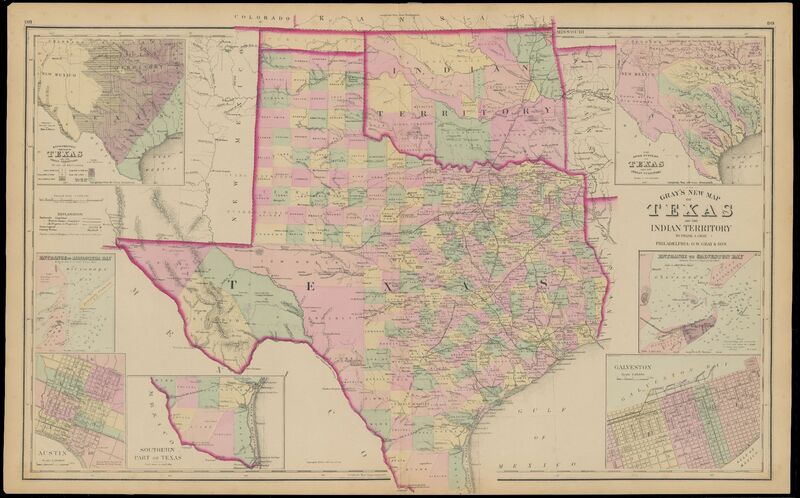 Citation: Rand McNally Standard Map of Texas. 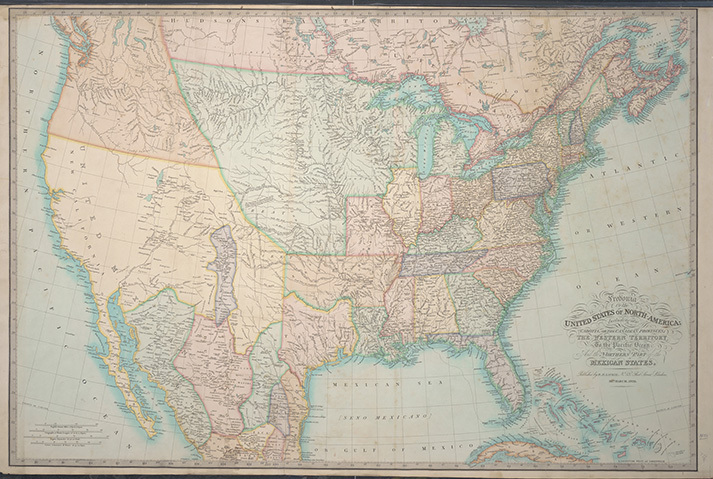 Chicago: Rand McNally & Co., 1921. 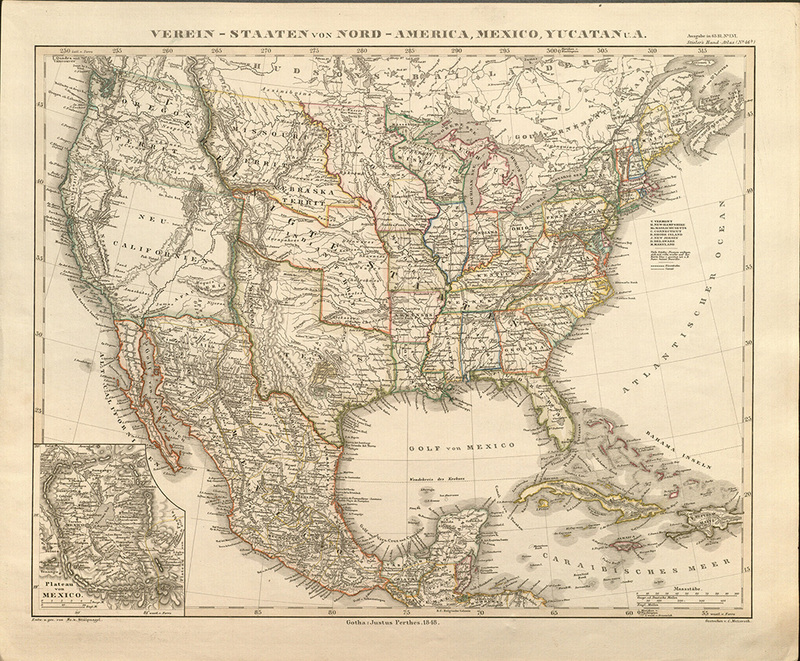 Citation: Rand McNally Standard Map of the United States, from The Rand McNally New Commercial Atlas of The United States. 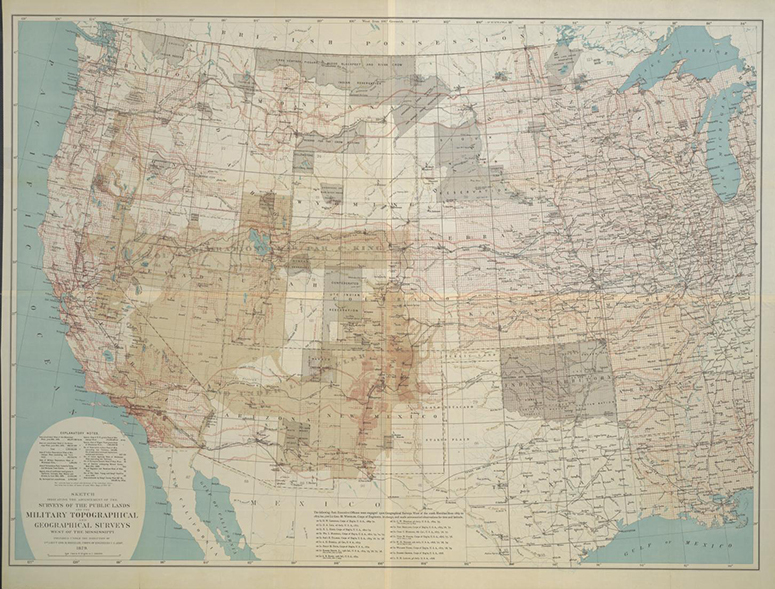 Chicago: Rand McNally & Co., 1921. 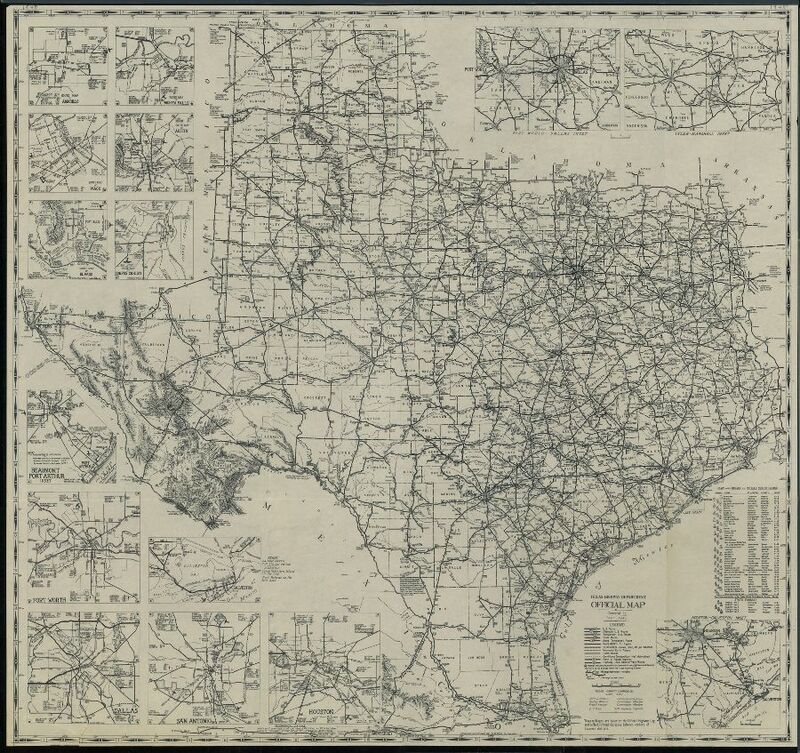 Citation: George F. Cram Co., Transcontinental Highways of the United States, in Auto Trails and Commercial Survey of the United States. 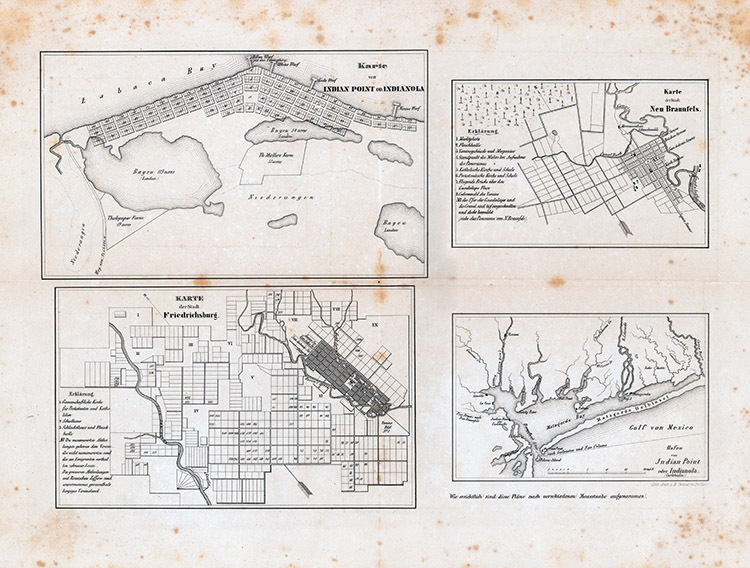 New York: George F. Cram Co., 1922. 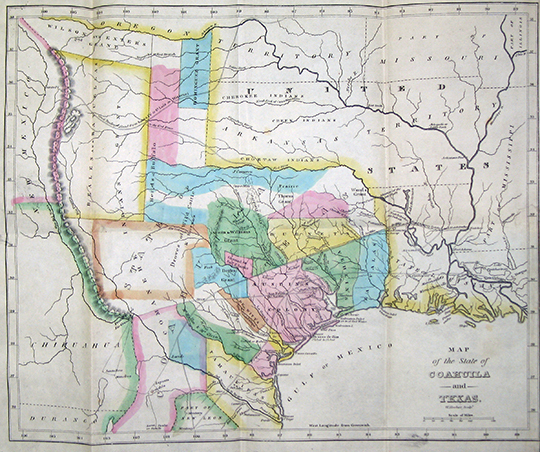 Citation: Clason’s Texas Guide Map to Texas and Northern Mexico in Clason's Texas Green Guide. 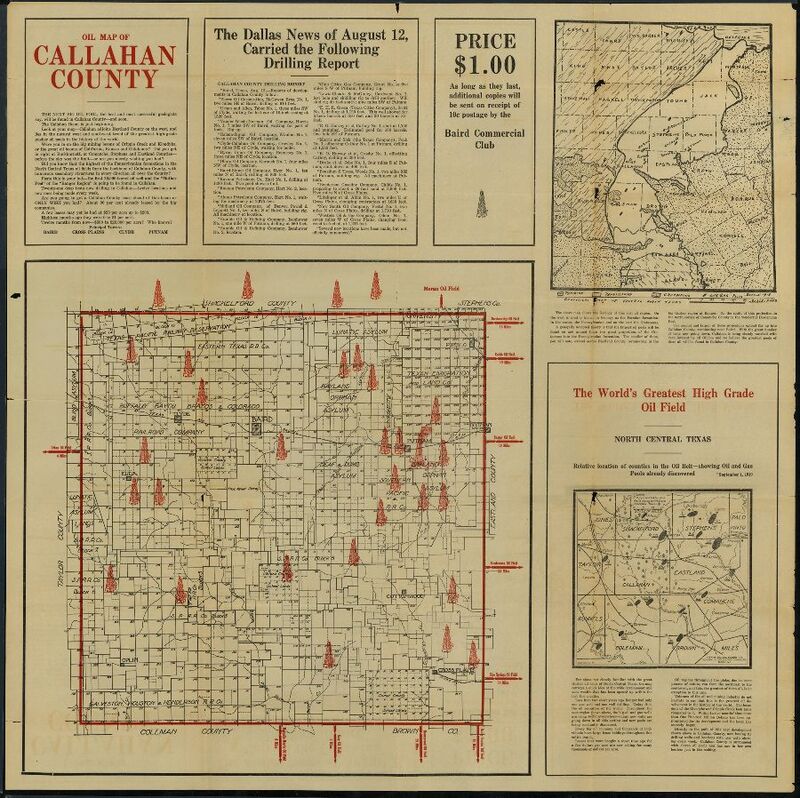 Chicago: Clason Map Co., 1931. 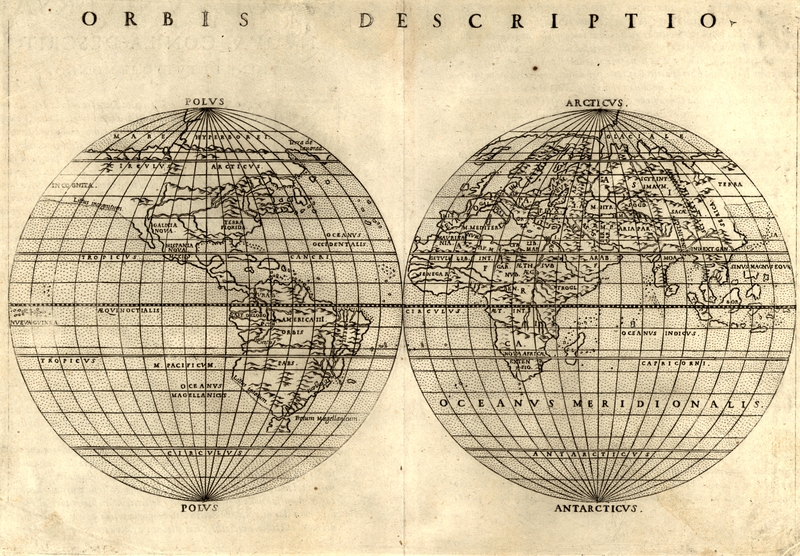 Citation: Cleartype General Map of the World on Mercator's Projection. 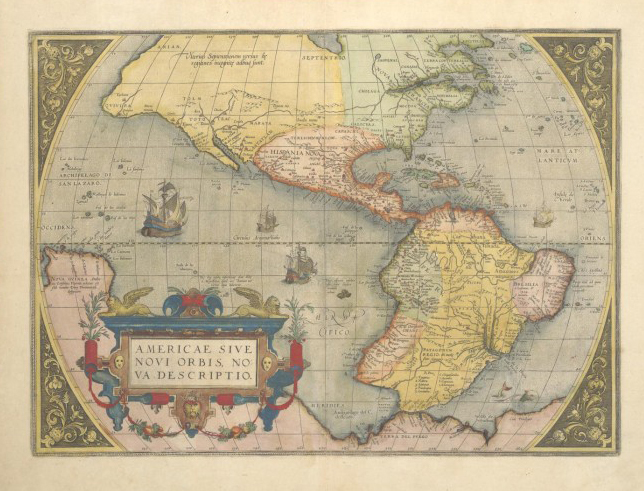 New York: American Map Co., Inc., 1940. 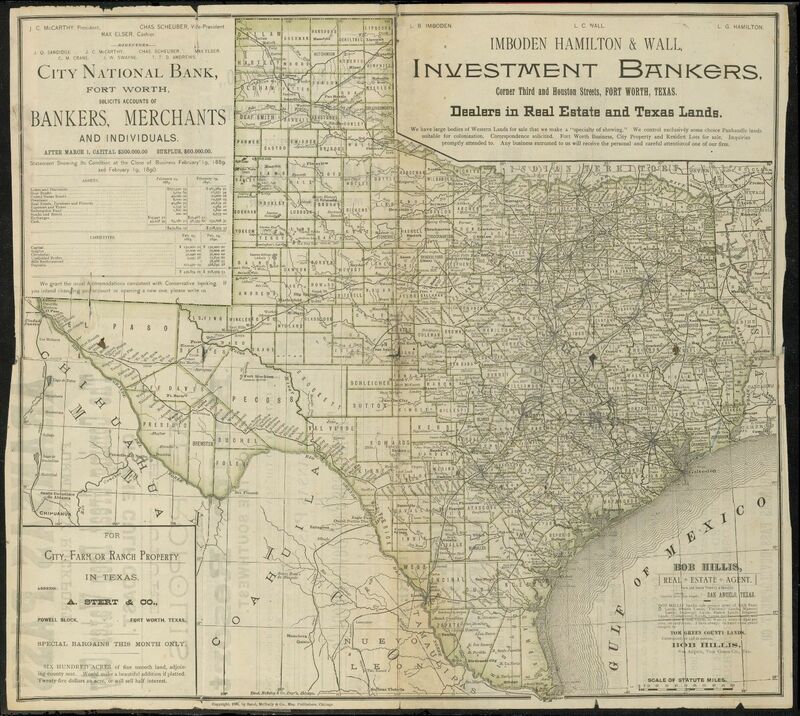 Citation: Rand Mc Nally & Co. Sinclair Road Map of Texas. 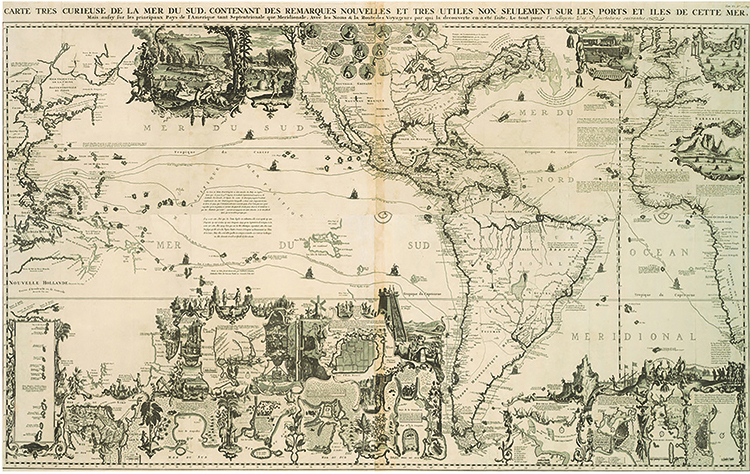 Chicago: Rand McNally & Co., 1941. 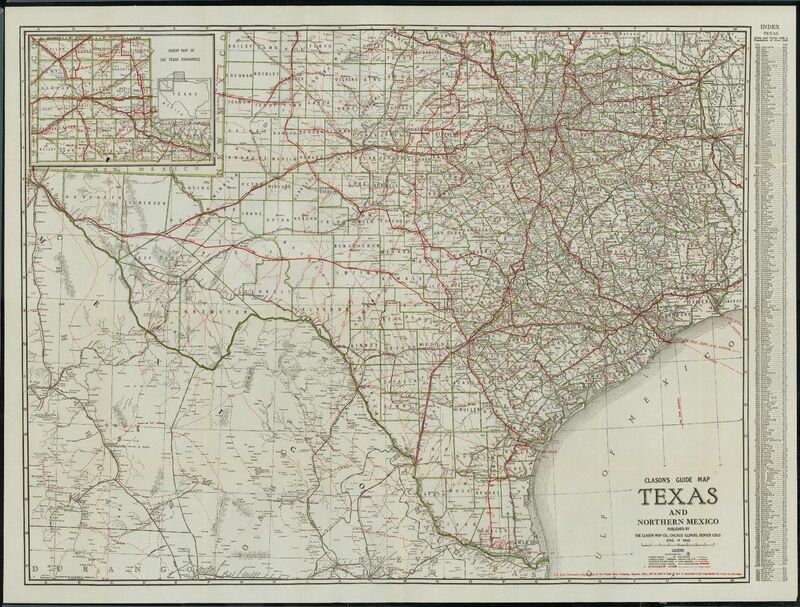 Citation: Texas Highway Department. 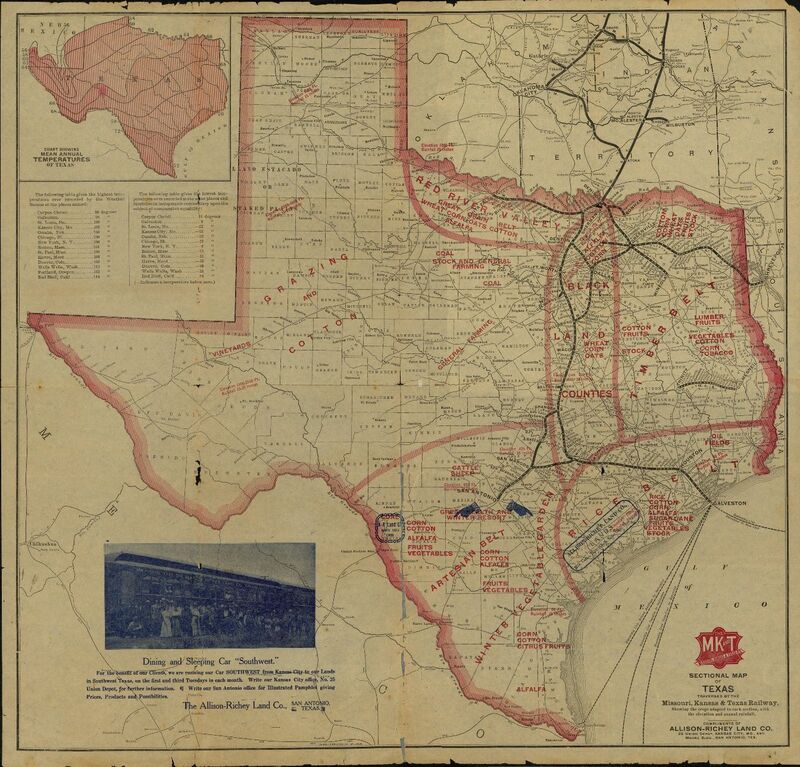 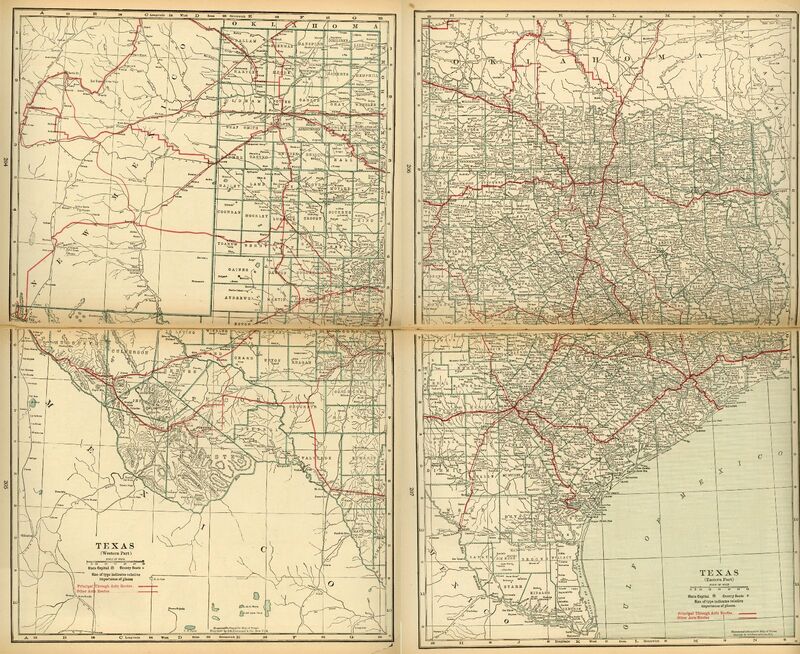 Texas Highway Map Compiled and drawn by R. M. Stene. 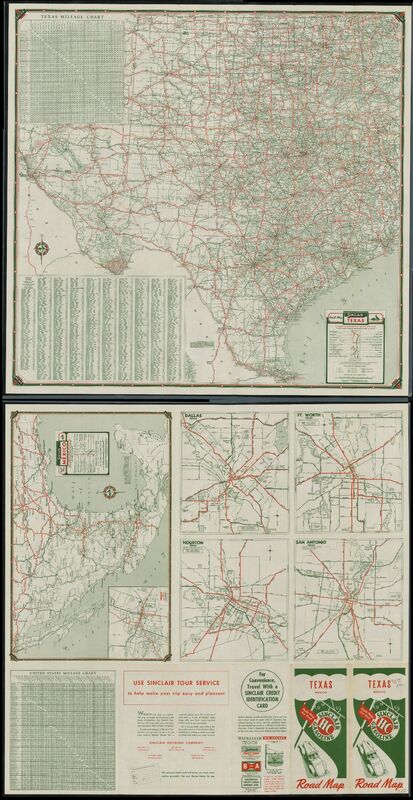 Austin: Texas Highway Department, 1941. 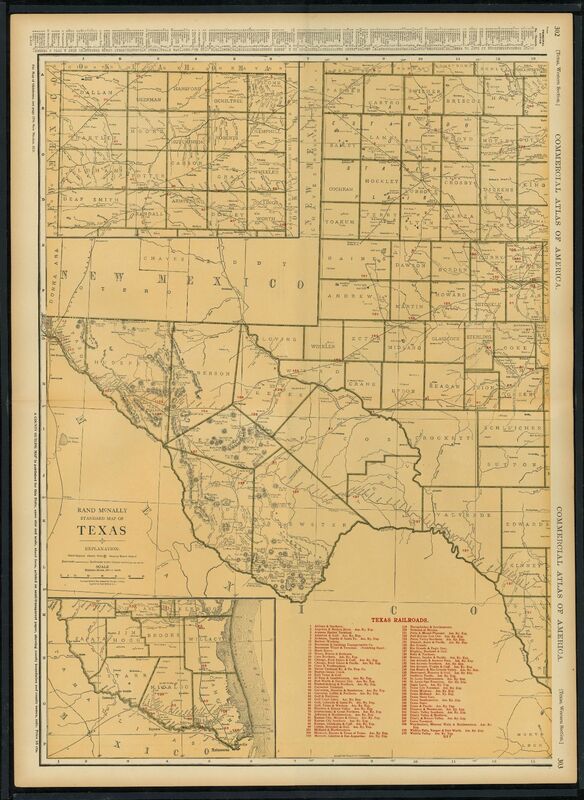 Citation: Texas Highway Department. 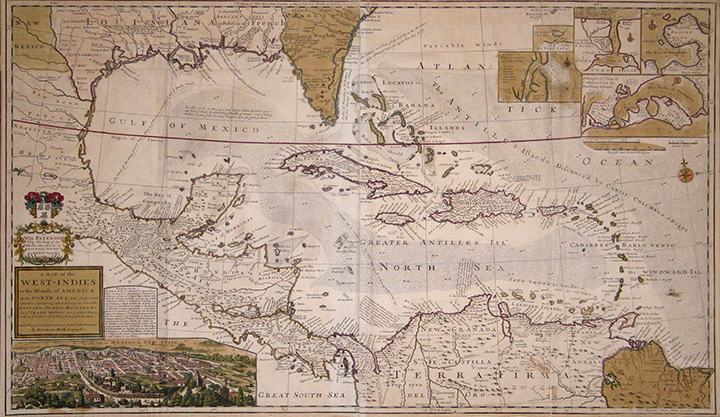 Official Map. 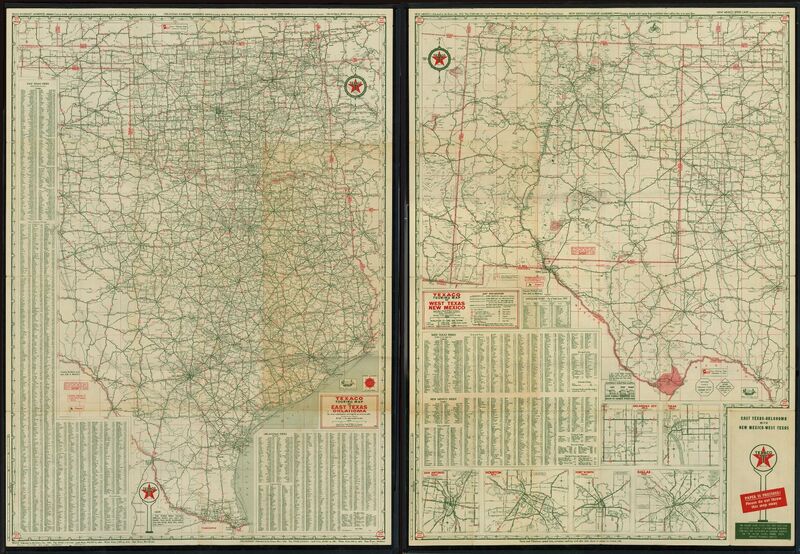 Austin: Texas Highway Map Department, 1945. 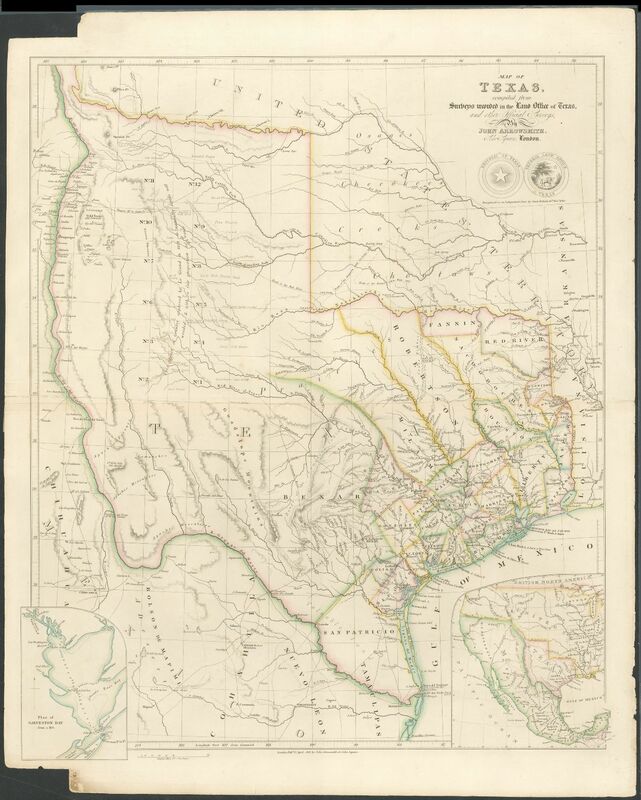 Citation: Journal Guide to Texas Oil. 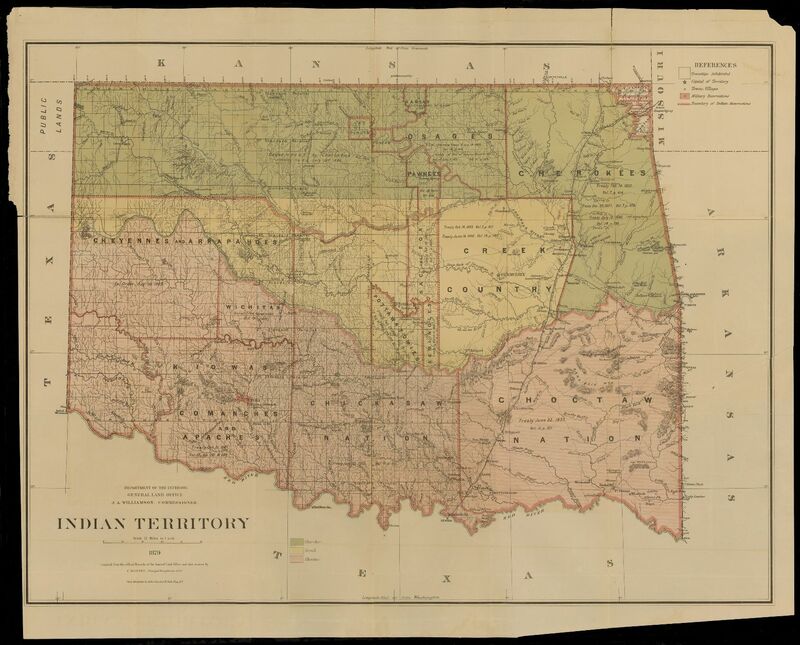 Tulsa: Petroleum Publishing Co., 1951. 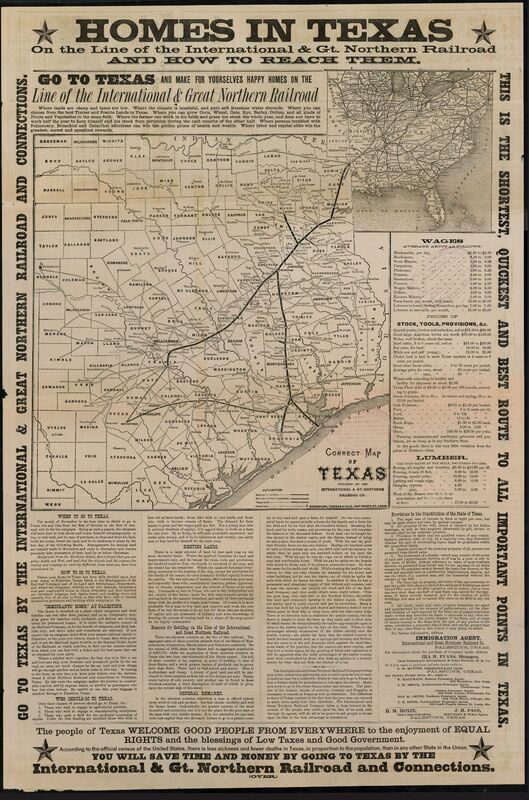 Citation: Texaco Touring Map of East Texas and Oklahoma/Texaco Touring Map of West Texas and New Mexico. 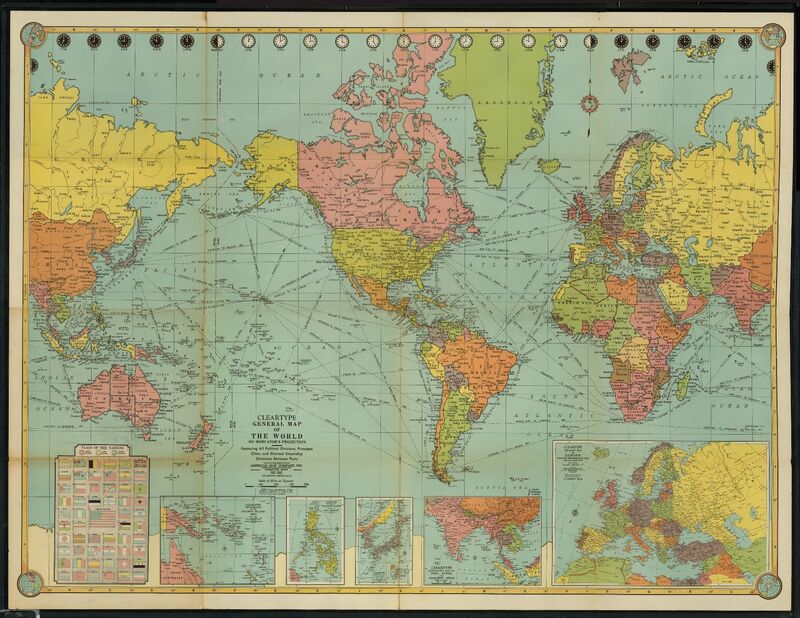 Chicago: Rand McNally & Co., 1951.